In 1886, William Stanley first successfully demonstrated the use of the transformer in an alternating current system to provide electric lights for the Town of Great Barrington, Massachusetts. In 1986, the General Electric Company announced that it would be closing its Large Power Transformer Operation in nearby Pittsfield. The existence of this plant was a direct result of Stanley's work one hundred years before. The technology associated with the design and manufacture of transformers in Pittsfield was sold to the Westinghouse Corporation, which built large transformers at a plant in Muncie, Indiana. However, about a year later, Westinghouse sold its Muncie operation to a foreign conglomerate known as "ABB" (ASEA - Brown-Boveri). Thus, one hundred years of transformer technology which had developed in the Berkshires of Western Massachusetts fell, unceremoniously, into foreign hands. My own involvement with the Pittsfield transformer operation began in 1966 when I joined the High Voltage Laboratory as a Development Engineer. Later, I became a Fortran computer programmer in the Engineering Department, working with elaborate development and design programs having to do with transient voltage distribution in transformer windings and stray magnetic losses in transformer cores. 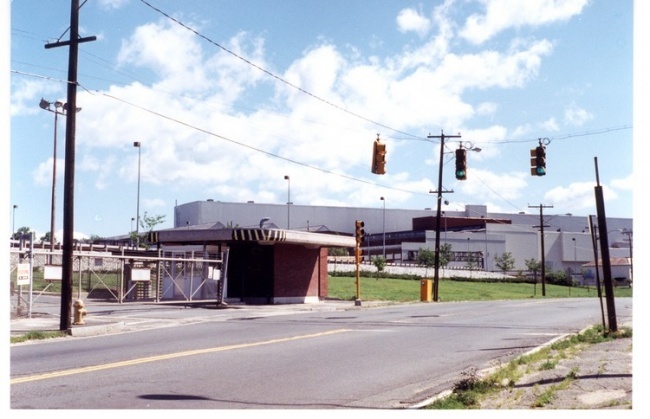 In 1987, when the Pittsfield transformer plant was closed down, I was employed as a Test Engineer working in Building 100, the cavernous main assembly building for large transformers. As such, I was to witness the somewhat bizarre spectacle of the "slow death" of this formerly bustling facility through the late summer and fall of that year. 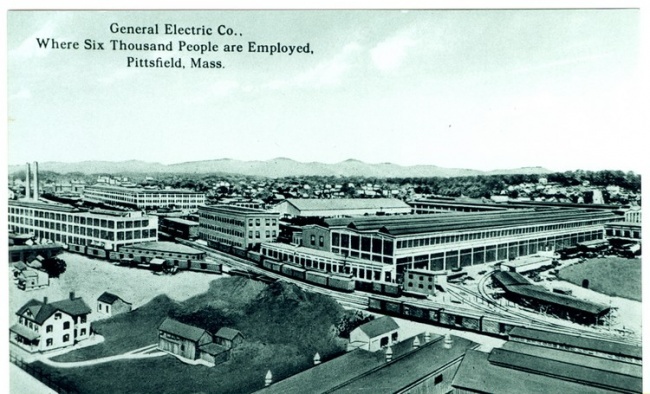 In 1903, when the Stanley Electric Manufacturing Company in Pittsfield first became affiliated with the General Electric Company, it employed about 1700 and the population of Pittsfield was about 25,000. At the peak of employment in the Pittsfield G.E. operation, around 1950, the Pittsfield population had climbed to 53,000; however, the employment in "Transformers" had risen to 10,000! Thus, General Electric had become a very significant factor in the economic and the social fabric of Pittsfield and, indeed, in all of Berkshire County. During the 1950's, several product lines related to transformers were moved to other locations around the country. This was the result of a vast reorganization and decentralization plan instituted by Ralph Cordiner, then the corporate head of the General Electric Company. As a consequence of this, the manufacture of capacitors was moved to Hudson Falls, New York; small distribution transformers were to be built in Hickory, North Carolina; and medium-sized power transformers were to be manufactured in Rome, Georgia. A "low point" in the history of transformers in Pittsfield came in 1961 when several high-ranking General Electric executives were caught up in a price-fixing scandal which involved major competitors such as Westinghouse. A real high point, however, was the construction of Building 100, the huge transformer assembly and testing building, in 1968. In 1972, the Company succeeded in obtaining the approval of the labor unions to switch hourly workers from incentive pay to "day rates" as a cost-cutting measure. This cost the average worker about $25.00 per week in lost wages. As a result, a critical drop in productivity led to "red ink" for the Transformer Operation. However, through the efforts of Bruce Roberts and Nicholas Boraski, the operation was eventually brought back into the black. That was not enough to save the Transformer Operation, however. In 1974, the "oil crisis" in this country caused the traditional seven to eight percent annual increase in electrical power usage to disappear. Thus, the market for new large power transformers essentially vanished. 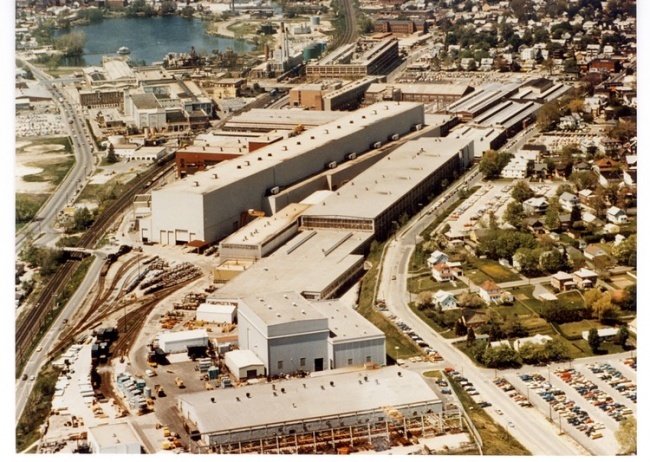 The Pittsfield operation was never able to recover from that blow and, in 1987, with 1900 employees remaining, the General Electric Company decided to end the business of building transformers in Pittsfield. Because of my background, as well as the nature of the business which is documented here, this historical outline is rather technical in nature. A Glossary of terms is included which serves to explain some of the more generally-used phrases pertinent to the design and manufacture of large power transformers. This book is an edited version of a manuscript by the author which was prepared during 1995-96, and which is catalogued in the Local History collection of the Berkshire Athenaeum in Pittsfield. Several professionals formerly associated with the Pittsfield G.E. Transformer Operation provided valuable information, as well as encouragement, for this work. On topics relating to the engineering and design aspects of transformers and related equipment, these included John Church, Bell Cogbill, George Doucette, Harry Mason, Bill McNutt, Bob Mottershead, Al Rowe, George Sauer, Leonard van den Honert, and Don West. Janice Calderwood provided information and material related to the Distribution Transformer Operation. Ed Kopf contributed valuable information on the early years of the Apprentice Program, as well as on many other aspects of life in the Pittsfield plant. William Coles provided details of Power House modifications over the years. Sam Sass contributed historical details related to the Stanley Library and other matters. R. Kelly Niederjohn and Stan Wilk provided information on the aspects of shipping huge transformers. John Anderson contributed information regarding the Empire State Building lightning study, as well as the operation of the High Voltage Laboratory and Projects EHV and UHV. John Benedict contributed photos and other material related to the Building 9 High Voltage Laboratory. Details relative to lightning arrester development and the operation of the Dufour cold-cathode oscillograph were provided by Tom Carpenter. Finally, much information about the operation of the transformer testing facility was contributed by G.G. ("Pete") Kemp and by Tom Stanfield. Access to archival material stored in the Pittsfield G.E. plant was provided by Tom Bednarz, William Carter, Jr., and Art Stringer. Information taken from issues of the Pittsfield G.E. News and the 'Current News', as well as other archival material, was obtained with the assistance of the staff of the Local History Room of the Berkshire Athenaeum in Pittsfield; special thanks to Ruth Degenhardt in this regard. 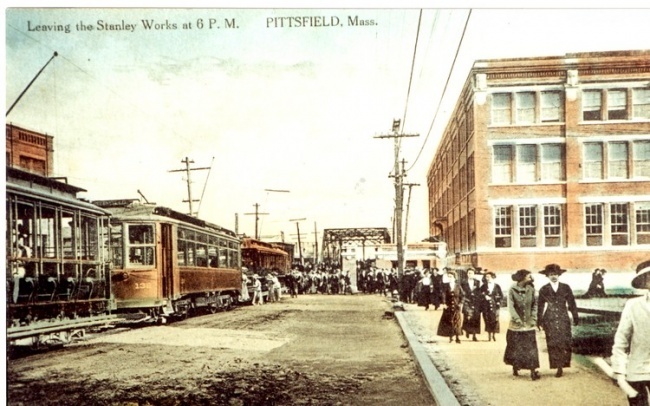 Postcard views of the early years of the Pittsfield plant were reproduced from the collection of Judy Rupinski of Pittsfield. Photographs from the collection of the Hall of Electrical History of the Schenectady Museum Association, Schenectady, New York, were provided with the assistance of staff members John Anderson and Mary Kuykendall. Also, "spiritual" support on matters relative to the publication of this work was provided by Paul Argentini. Digital processing of G.E. photographic negatives was by Mark Swirsky of the Photo Shop in Pittsfield, MA. Special recognition is due the late "Jimmy" Eulian, former High Voltage Laboratory technician, for providing many fascinating reminiscences from his forty-one years of employment in the Pittsfield G.E. plant. Finally, the author wishes to give special recognition as well to two highly regarded professionals, now retired, who were very instrumental in the development of his career at the Pittsfield plant: Mr. Al Rohlfs, formerly with the High Voltage Laboratory, and Mr. Ed Uhlig, former Manager of Power Transformer Engineering in Pittsfield. "One day Mr. Whittlesey came to Barrington and I told him of my withdrawal from the Pittsburgh company. He asked me to come to Pittsfield and see some of his friends before I embarked anew. I came up to Pittsfield and met two sterling men, the late W.R. Plunkett and the late W.W. Gamwell. Mr. Plunkett called a meeting of businessmen at his residence on East Street. A dozen or so attended this meeting and we discussed the starting of a company to build transformers. Mr. Whittlesey then got subscriptions for $25,000. Two companies were organized. One, 'The Laboratory Company', with a small capital, in which Messrs. Chesney, Kelly and myself were the principle stockholders, and the other, 'The Manufacturing Company'. Mr. Chesney was chosen as the works manager of the manufacturing company and we started in." The above quotation describes William Stanley's departure from the Westinghouse Company in Pittsburgh, and the subsequent establishment of a transformer manufacturing plant in Pittsfield. 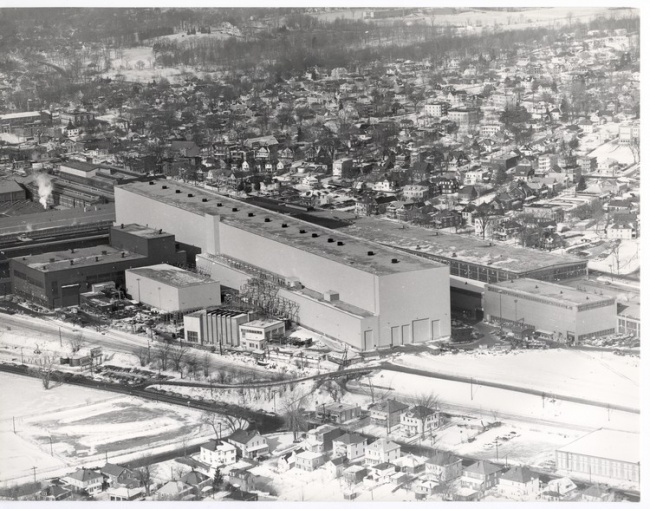 Thus began the ninety-six year history of the manufacture of transformers in Pittsfield which ended with the closing of the Large Transformer Operation of General Electric in 1987. The Stanley Laboratory Company originated in a building on Cottage Row (now Eagle Street) in Pittsfield, in 1890. The Stanley Electric Manufacturing Company went into operation on Clapp Avenue (now gone) in January of 1891. The Works Engineer was Cummings Chesney and the Shop Superintendent was John Kelman. The first shipment of "S.K.C." (Stanley-Kelly-Chesney) transformers left the shop on April 1, 1891. The last G.E. power transformer cleared "Test" in Building 100 in Pittsfield in October of 1987. In 1892, the Clapp Avenue works employed sixteen people. Just one year later, a new plant employing 300 people went into operation on Renne Avenue! The Clapp Avenue plant was then used for the manufacture of switchboards. In 1895, the Stanley Electric Manufacturing Company absorbed the Stanley Laboratory Company. In 1899, a controlling interest in the manufacturing company was sold to John A. Roebling & Sons of Trenton, New Jersey (the builders of the Brooklyn Bridge), and the Stanley Company was reorganized under the corporate laws of the State of New Jersey. F.A.C. Perrine, who was related to the Roeblings by marriage, was named the new president of the company. There was much trepidation in Pittsfield as to whether the company would remain here or not. At this time, William Stanley "retired" and agreed to be a consultant "if needed". The company did remain in Pittsfield and, in 1900, under the direction of Perrine, construction began for a new plant in the Morningside section of the city. 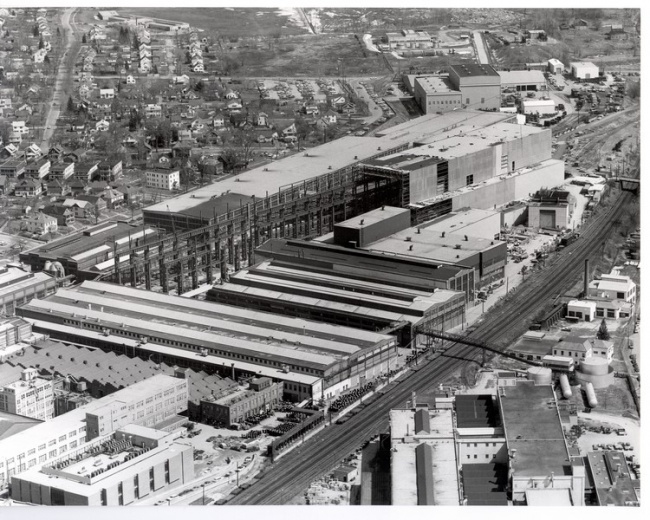 This was the beginning of what would eventually become the sprawling General Electric "main plant" complex. In 1901, the Morningside plant employed 1200 people, and both the Clapp Avenue and the Renne Avenue plants were abandoned. As mentioned, William Stanley became a "consultant" and went on to pursue other interests. One of his partners, Cummings C. Chesney, became the Works Manager of the Morningside plant. The other partner, John Kelly, eventually quit when his Irish temperament would not allow him to work for a former competitor as the company became a subsidiary of General Electric in 1903. In that year, General Electric bought a controlling interest in the Stanley Company. At the same time, G.E. bought out the General Incandescent Arc Light Company of New York. These two companies were combined to form the "Stanley - G.I. Company". Once again, there was much trepidation in Pittsfield as to whether the company would remain here or not! However, in 1905, a massive expansion of the Morningside plant was announced. 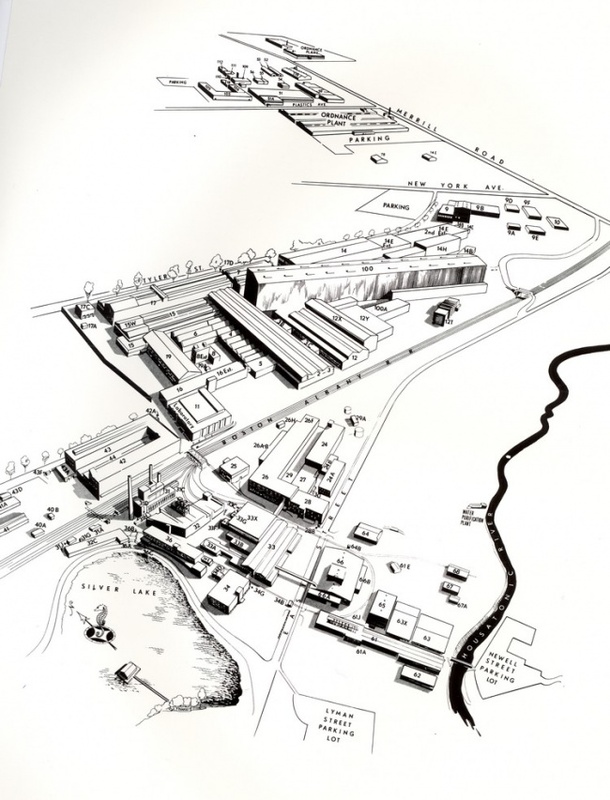 In 1907, the plant became the Pittsfield Works of the General Electric Company and, by 1912, it covered an area which included 1,600,000 square feet of buildings. 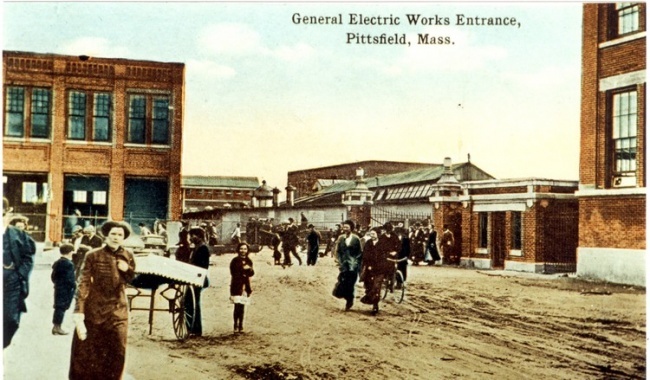 In 1915, one-sixth of the population of Pittsfield were employed in the plant, and it produced a total of 4,800,000 "horsepower" in transformers (roughly 3.6 million kilowatts worth). Also produced were flat irons, electric fans, and small motors. According to an article in the October, 1908 issue of the General Electric Review, G.E. decided to use the Pittsfield plant for the manufacture of transformers in 1907 because the area afforded "opportunities for the acquisition of skilled labor of American extraction"! At first, only small standard transformers (known as Type 'H') were built in Pittsfield; however, in September of 1907, the Lynn (Mass.) Transformer Department was moved to Pittsfield and, by 1908, the Schenectady (N.Y.) transformer operation as well. Thus, in 1908, all G.E. transformers, with the exception of some small specialty types, were being manufactured in Pittsfield and the plant had increased in size by another fifty percent. 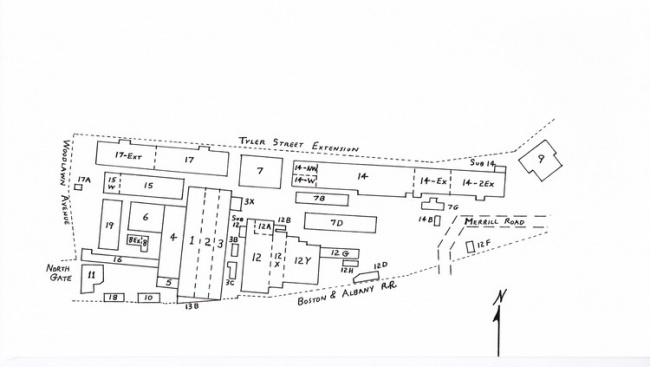 The preceding page shows the building layout of the plant in 1908, just after it became the Pittsfield G.E. Works. The area shown is that located north of the New. York Central and Hudson River Railroad tracks. This was actually the right-of-way for the Boston & Albany Railroad, which was owned by the NYC&HRRR. These tracks do still exist, and serve Conrail and Amtrak trains which run between Boston, Mass. and Albany, N.Y. 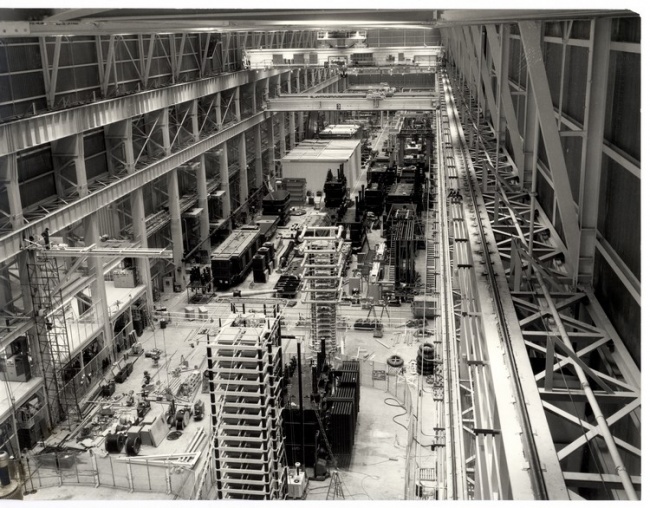 These were the main transformer assembly and testing bays. Building 1 was constructed in 1900, and Buildings 2 and 3 were added around the time that the plant became a part of G.E. These buildings still exist today. This was the main winding area for the larger sizes of transformers. It also still exists. This was also the assembly area for small types of transformers. This was the main shipping area. It was served by a railroad siding running along its south side; this siding also ran through the south end of the Building 1-2-3 complex. This building eventually housed offices and the "copper shop", and still exists. This was the area in which the various types of insulation (such as pressboard, etc.) needed in the transformers was prepared. It still exists. This was where the thin laminations of steel needed to build up the magnetic cores of the transformers were fabricated. This building served several other functions in later years. It still stands, but is somewhat derelict. This was the Laboratory building where the development of transformer insulation materials, and the high voltage testing of same, was carried on. It still stands, but is also somewhat derelict. This no longer exists; it was a storage facility for the oils used in transformers for insulation and cooling. This was identified as a Carpenter and Pattern Shop, and no Longer exists. This was the Brass Foundry and Tank Shop, for the production of brass electrical fittings and the fabrication of the iron tanks which held the working parts of the transformers. The site is presently occupied by a new Building 11 dating from the 1960's. The building near the Main Entrance, designated as "Storage", was soon after replaced by Building 16; this became the main Engineering and Drafting building for the transformer operation. It still stands. Around this same time (1909-10), an addition known as Building 13 was constructed at the south end of the Building 1-2-3 complex; it is now gone. 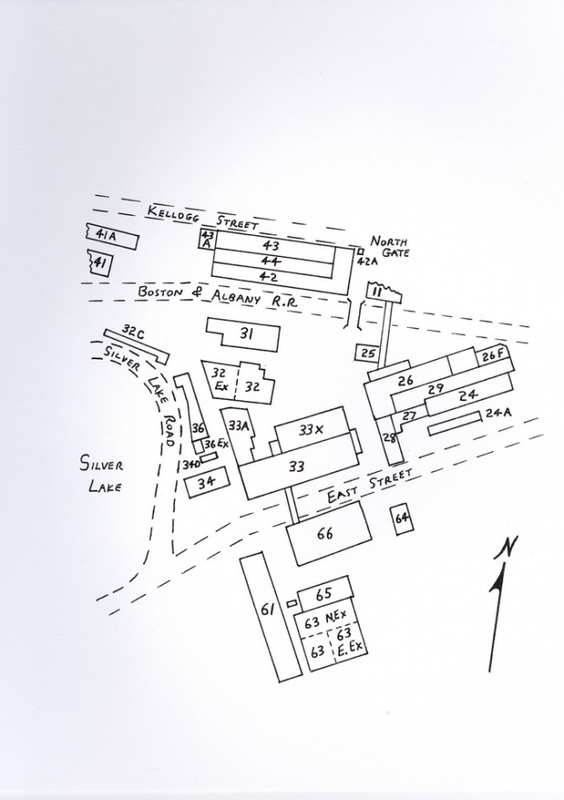 Also, a new Tank Shop (Building 14) was constructed to the east of Building 7, and a new shop for core steel (Building 15) was added to the north of Buildings 4 and 6. In 1914, a larger transformer assembly and testing facility known as Building 12 was begun to the east of Building 3. All of these latter buildings still exist. Also, the area designated as "Proposed Building" became Building 17. Originally, this also served as a Tank Shop; however, for many years after that, it was the main winding facility where most of the large transformer windings were constructed on winding "lathes". This building still stands. an iron foundry, using cupola-type melting furnaces, for the production of cast iron transformer tanks (in later years, the tanks would be made of welded steel plates). This was on the site of the present Building 33.
a building for producing molded-type insulations, and a building for the kiln-drying of wood insulation materials. a building for the manufacture of fan motors. 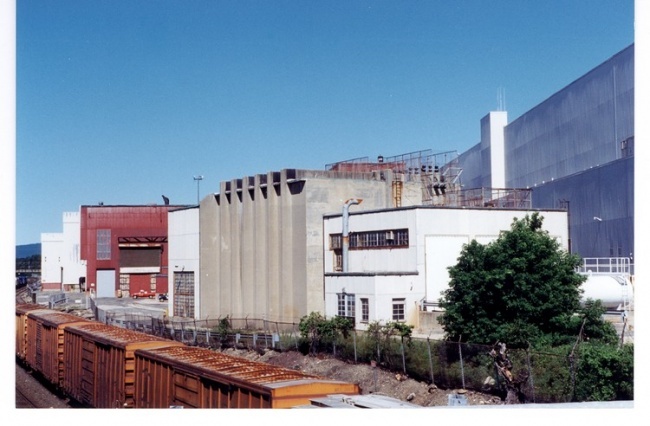 This became the site of Building 26 which was razed in 1988.
the original Power House for the plant. This became Building 31 which still stands, but is now derelict. 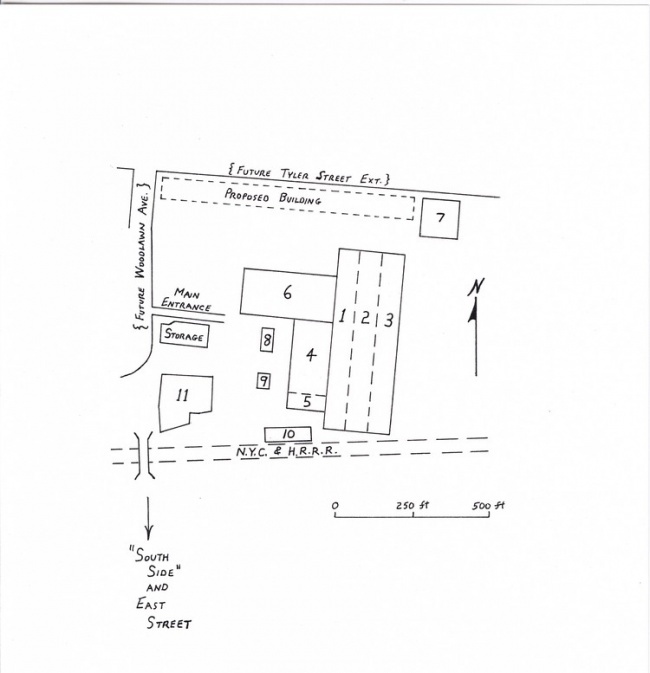 The 1908 layout of the "North Side" of the plant shows a curve in the street line to the north of the railroad bridge. Eventually, this became the intersection of Woodlawn Avenue and Kellogg Street. Also, this became the site of the "North Gate", a new main entrance to the plant. The establishment of North Gate coincided with the construction of a main office building, Building 42, in 1911. This building was directly across from (to the west of) Building 11. Two years later, an addition was constructed running west along Kellogg Street. This was known as Building 43 and contained more office space. Both Buildings 42 and 43 still exist, but are unused. 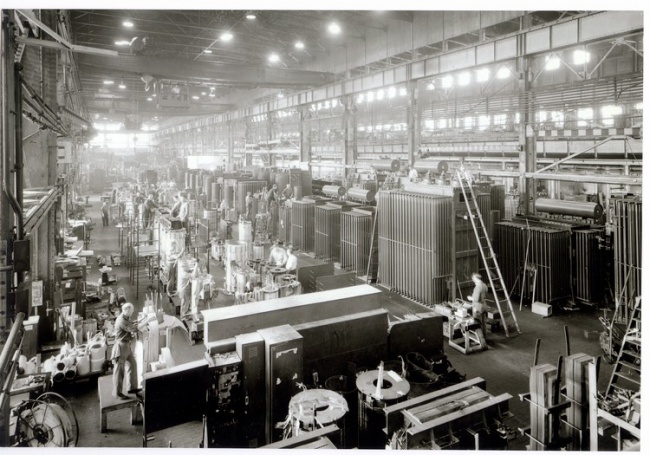 Along with the main offices for the plant, there was some production area in Building 42; this was mainly devoted to the manufacture of heating devices. 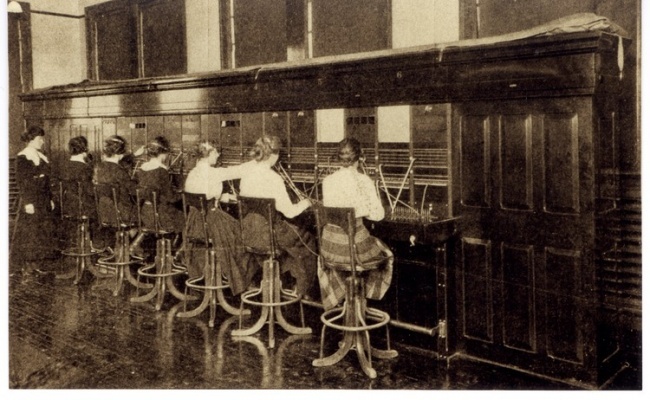 Also, there was a Telegraph Office with connections to both the Postal Company and Western Union, along with a line directly to the Schenectady G.E. plant. In addition to offices, Building 43 contained production area devoted to the manufacture of lightning arresters, a tool room, and space for the training of Apprentices. An interesting aspect of the electric power system in the Morningside plant is that it was not the standard three-phase type of power which is universally used now. The generation and distribution was via a system known as "two-phase". William Stanley designed and built a great deal of two-phase equipment during the 1890's, partly because of a belief in its superiority over three-phase, but also to avoid patent infringement problems with General Electric and Westinghouse who both used the three-phase system. In fact, three-phase is decidedly superior for power distribution purposes. Thus, the old two-phase systems have gradually faded out of existence. However, two-phase power was so firmly entrenched in the Pittsfield plant that remnants of it still exist today! This has to do with the existence of old two-phase motors which have never been replaced. Three-phase power consists of three alternating-type voltages intermingled on three wires. It can be proven mathematically that it is the most efficient system for transferring large amounts of electric power from one place to another, considering the weight of copper which is necessary to do so. However, in the early 1890's, the understanding of the complexities of "polyphase" (more than one phase) systems was still limited. In particular, there were problems in learning how to regulate the three voltages in a three-phase system in order to keep them all at a constant level. Varying voltage levels severely reduced the expected life of the early incandescent lamps. Since the basic two-phase system consisted of two completely separate two-wire single-phase circuits, independent regulation of each circuit was relatively simple. This was the main reason that Stanley, as well as others, advocated the use of the two-phase system. 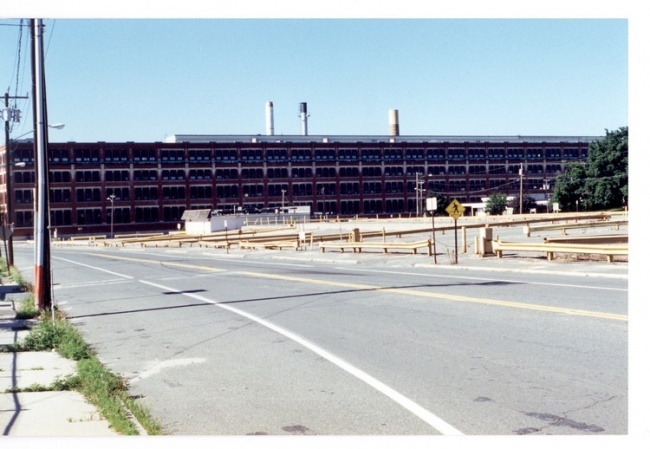 The two-phase system which was adopted in the plant in Pittsfield was somewhat unusual in that only three wires were used instead of four; one wire served as a common for the two single-phase circuits. The two voltages in a two-phase system are at ninety electrical degrees to each other. Thus, when one wire is used as a common return, the current which flows in it is 41 percent greater than the current in the other two wires, even when feeding a balanced load such as a motor. Because of this, feeder cable runs in the plant often consisted of two cables of one size plus a third cable which was roughly fifty percent larger in cross-section. However, sometimes it was apparently easier to deal with just one size of cable; in such situations, four cables were run and two were paralleled to use as the common. Obviously, this led to some waste in the total amount of copper used. The original plant Power House dated from 1900 when the Stanley Company moved from Renne Avenue and Clapp Avenue in Pittsfield. The first generators installed were two-phase machines. By 1950, there were still a couple of two-phase generators (of later vintage) being held in reserve for emergencies. However, the active generation by that time was all three-phase. Over the years, phase-changing transformers had' been installed in some of the electrical substations around the plant to provide two-phase power to old motors still in use. As of today (1997), there are still one or two of these special transformers in use for this same purpose! The windings of the phase-changing transformers were of a special design developed by G.E. engineers which would have allowed the transformers to be converted to straight three-phase transformers at some pertinent time. Doubtless, these engineers would have been surprised if they knew that such a changeover was destined never to happen! The two-phase generation and distribution voltage was originally chosen to be 2300 volts, and this was never changed through the years. In 1900, and for some years after that, all of the generators in the Power House were belt-driven from reciprocating steam engines. In later years, of course, the old engines were slowly replaced by steam turbines, and the generators replaced by more modern designs. The Power House was erected near to Silver Lake, so as to have an adequate supply of cooling water for condensing the steam. Eventually, this became known as Building 31. For some time prior to 1970, General Electric had a cogeneration agreement with the Western Massachusetts Electric Company whereby they purchased any excess power available from the Power House. During the 1980's, it was determined that the Power House could not be brought up to existing pollution standards. Accordingly, G.E. instigated the construction of a new cogeneration plant on property which they owned to the east of the main plant. The plant Power House was then completely shut down. Today, the new plant sells electric power to Northeast Utilities, and sells steam for heating purposes to General Electric. When in full operation, the plant Power House provided high pressure process steam, low pressure heating steam, and compressed air for manufacturing use. By 1915, major substations in the plant were located in, or near, Buildings 4, 12, 15, 41, 42, and 43 on the North Side, and Buildings 26, 32, and 33 on the South Side. In addition, there was a separate set of feeders from the Power House to the main transformer testing facility in Building 12 (because of the large amount of power required by that operation). 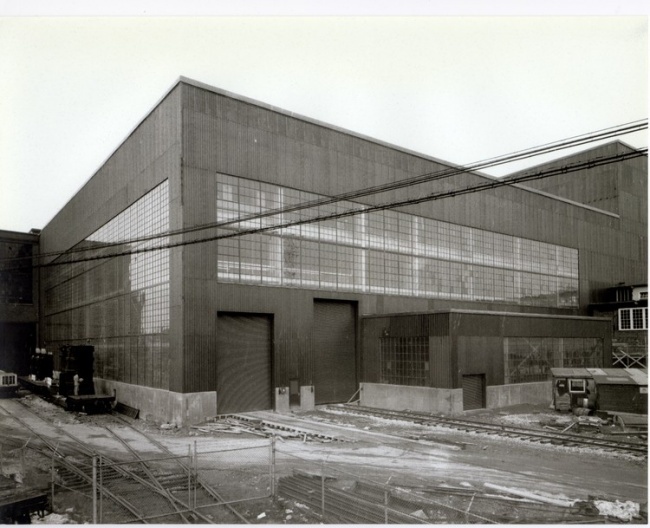 As a matter of interest, all of the steel buildings in the plant were connected electrically by means of a large diameter copper cable; this, in turn, connected to a grounding plate at the bottom of nearby Silver Lake! 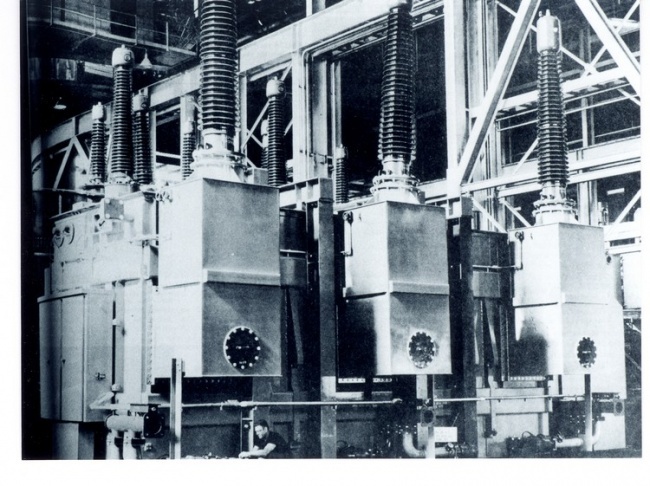 The three-phase system, as it evolved in the plant, operated at 13,800 volts (13.8-kv). 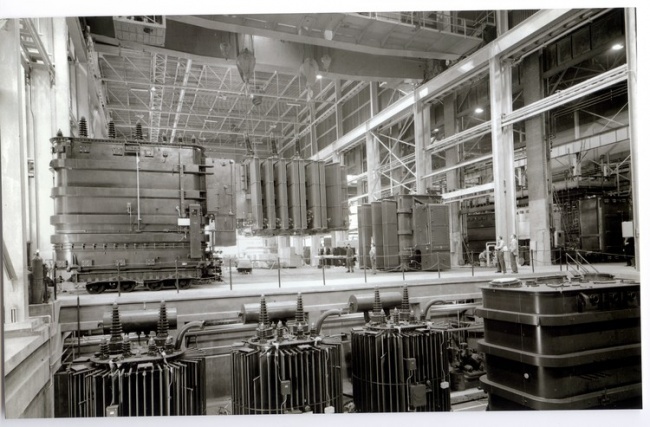 In 1936, switch-gear was installed in the Power House in anticipation of an interconnection between the plant and the lines of "The New England and Turner's Falls Power Company". These were 115-kv lines which terminated at the Silver Lake Station of the Pittsfield Electric Company. Two Pittsfield-built transformers were installed near Silver Lake. These had dual secondary windings. One winding connected with the 13.8-kv three-phase plant power system, while the other winding connected: with the 2300-volt two-phase plant power system (via a phase-changing winding connection). The mercury turbine installation referred to above was the result of development work in the use of mercury vapor as a more efficient alternative to high pressure steam for driving turbines. Complications in the technology, however, led to its eventual abandonment (today, such a concept would probably be unacceptable due to the usage of vast amounts of toxic mercury!). Chapter 3: The "Current News"
During the years 1913 through 1931, the Pittsfield G.E. plant newsletter was known as the "Current News". This was a glossy magazine-style publication which was printed on a monthly basis. It is not known exactly why it ceased publication in 1931, but it may have been a casualty of the Great Depression; it was probably fairly costly to produce. After a lapse of three years, it was replaced by a newspaper-style publication known simply as the "Pittsfield G.E. News". The following is a compendium of interesting items taken from the "Current News". The emphasis is on technical developments related to transformers as well as items relating to expansions and changes within the plant. However, there are also miscellaneous "tidbits" of information which deal with people-related and community types of events. The High Voltage Engineering Laboratory was formed. One of the many brilliant technical men associated with the Pittsfield plant over the years was A.M. Gifford, who headed the Laboratory operation for 45 years. Gifford was instrumental in the quest for the development of improved transformer core steel which drastically cut magnetic losses. Known as silicon steel, this material was actually first developed in England in 1907 by Sir Robert Hadfield. Gifford also promoted the use of Pyranol, a non-flammable transformer insulating fluid which was eventually banned in the 1970's, being a suspected carcinogen. He was heavily involved in development work through the years which eventually led to the creation of the G.E. 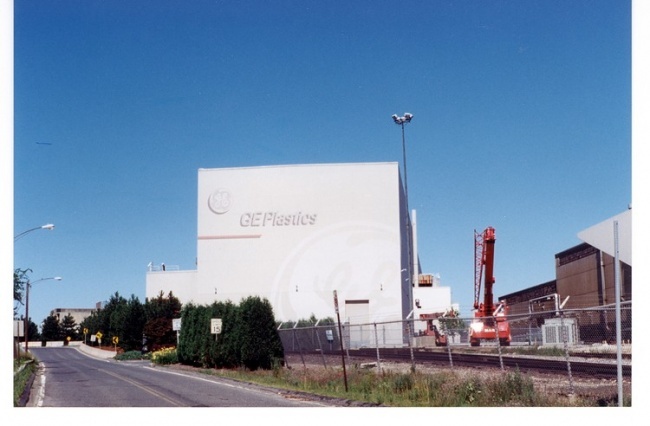 Plastics Operation, the only vestige of General Electric remaining in Pittsfield in 1997. Finally, he was instrumental in the development of Calrod heating units, still used in conventional electric ranges and ovens. For many years, these were manufactured in a building on Columbus Avenue in Pittsfield. Construction was begun on Building 12 which was to become the main transformer assembly and testing facility for large transformers. A new Works Restaurant, located on Kellogg Street near the North Gate, was opened. 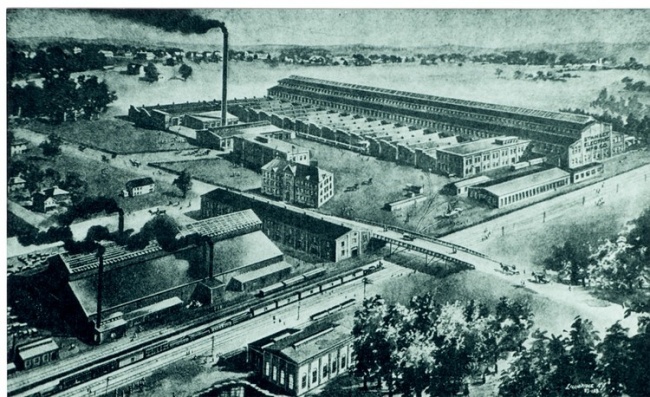 Flatirons were being manufactured in a section of Building 43. The G.E. Band was organized. The quality of the plant's drinking water was being questioned! An addition (known as "17Ext") was made to Building 17, located near the corner of Tyler Street and Woodlawn Avenue. Originally built in 1910, Building 17 had become the Tank Shop where steel transformer tanks were fabricated. The original Tank Shop had been on the site of the present Building 11. William Stanley died in Great Barrington. G.E. sponsored an elaborate production of Gilbert and Sullivan's "The Mikado", at the Colonial Theatre on South Street in Pittsfield. The Works Restaurant began serving breakfasts in addition to other meals. The manufacture of fans and motor armatures was begun in a building on Columbus Avenue in Pittsfield, which had been purchased in 1916. The first commercial testing of transformers in the new Building 12 facility was begun. Lightning arresters were being manufactured in Building 41, heating devices (including Calrod units) in Building 43, and small motors in Building 26. The General Electric Athletic Association, known as the G.E.A.A., was formed. 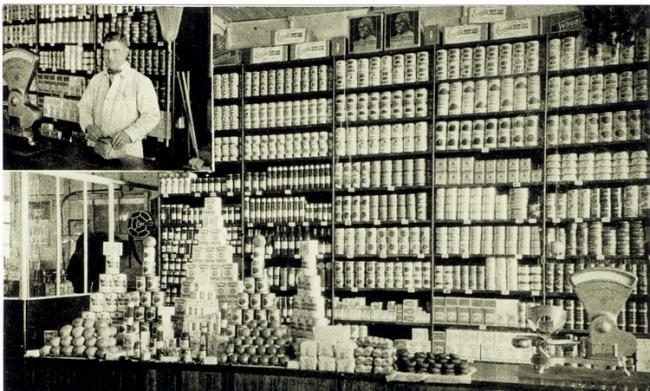 A new Employees' Food Store was opened in Building 42. The April, 1918 issue of the "Current News" was a special Liberty Loan issue. The Liberty Loan goal for the Pittsfield plant was set at $3,000,000.00. This was basically a loan to the U.S. Government to support U.S. involvement in World War I. 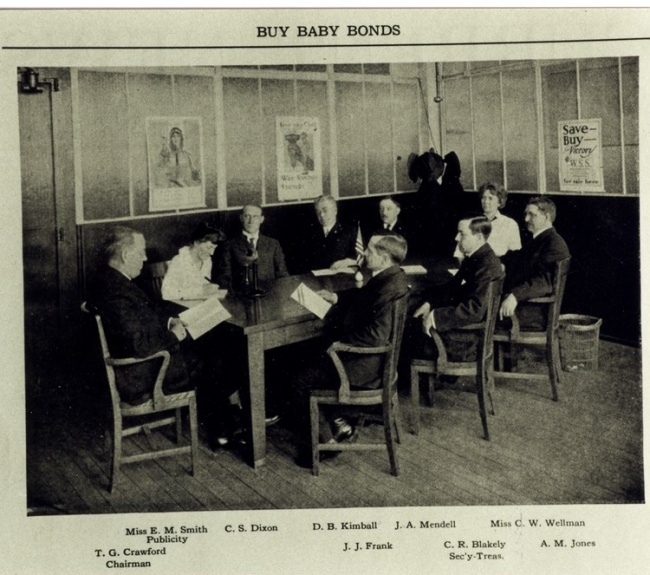 War Savings Certificate Stamps (known as "Baby Bonds") were a means of making smaller contributions for those who could not afford to purchase a full Liberty Loan Bond all at once. In September, the Hon. Crawford Vaughan, ex-premier of South Australia, gave a "pep talk" to employees of the Pittsfield plant. At the conclusion of his speech, he said "I ask you to give three cheers for the Boys at the Front". Three cheers were given, followed by great applause and a rendition of "The Star-Spangled Banner" by the Works Band. In attendance were Pittsfield notables Miss Mira Hall, proprietress of Miss Hall's School in Pittsfield, and her niece, Miss Margaret Hall. The plant's telephone exchange was located on the top floor of Building 16. A new Machine Shop started operations in a section of Building 15. The original Machine Shop had been located at the north end of the Building 1-2-3 complex, an area known as the "hill" because it was on a higher level than the rest of the building due to the rise in the land beneath. A new auditorium in Building 16 was dedicated. G.E. sponsored an oriental musical revue at the Colonial Theatre called "Jappyland"! An article by a former New York City resident sang the praises of life in the Berkshires because living and working in "the City" meant a long commute every day and very high prices! A new Building 17 was built; this was to become the Winding Room where most of the large transformer windings were assembled for many years. Building 14 (originally built in 1909) had just been remodeled to become the new Tank Shop. A.B. Hendricks first produced a one million volt, three-phase arc in the High Voltage Lab. The Stanley Library was created and housed in Building 16. This library combined a former Works Library in Building 42, a Laboratory library in Building 8, and one thousand volumes from William Stanley's personal library. The latter was a gift from Stanley's widow, Lila C. Stanley. The idea for the combined library was that of Cummings C. Chesney. In 1948, the Stanley Library was moved back to Building 8 following the construction of a new floor in that building to vertically divide the "high bay" laboratory area there. General Manager Robert Paxton arranged for a $50,000 appropriation to accomplish this. In 1966, the Library was moved to the newly-constructed Building 11. This building housed facilities for visitors, and General Manager Robert Gibson recognized that the presence of the Library would contribute to the impression that this was a top-notch research facility. According to Samuel Sass, venerable Librarian during the latter years of the Pittsfield G.E. operation, an interesting early use of a small building in the plant (Building 43A) came to light when he was looking for storage space for library books which were not often requested. This building had been equipped with shower stalls and foot baths which, it turned out, dated from the days when lead oxide pellet lightning arresters were manufactured. The employees were required to shower and change clothes before going home so as not to take the lead dust with them! This procedure had been instituted by a pioneer in the field of industrial toxicology, Dr. Alice Hamilton. She had been hired by Gerard Swope, president of General Electric, in 1923. In her capacity as Medical Consultant to the company, she recommended this and other procedural changes at the Pittsfield G.E. facility. Dr. Hamilton died in 1970 and, as reported in the Berkshire Eagle of February 18, 1996, she has been honored by the United States Postal Service by the issuance of a stamp as part of its Great American series. A new Wood Shop went into operation, located in Building 7D. Dial telephones were installed in the plant. A 110-Kv double-circuit transmission line was placed in operation which connected the Pittsfield Electric Company with a hydroelectric plant at Turner's Falls, Mass. This line terminated at the Silver Lake Station of the Pittsfield company, adjacent to the G.E. Power House. It was about this time that the first ties were made between the G.E. power system and that of Pittsfield Electric. The 110-Kv transmission line is still in operation. The Stanley Club, a G.E. business-oriented social club, was organized in Pittsfield. The construction of Building 12X was announced. This was referred to as the "super-transformer building" for the assembly and testing of the largest transformers. It was built as an extension of the east side of the existing Building 12. 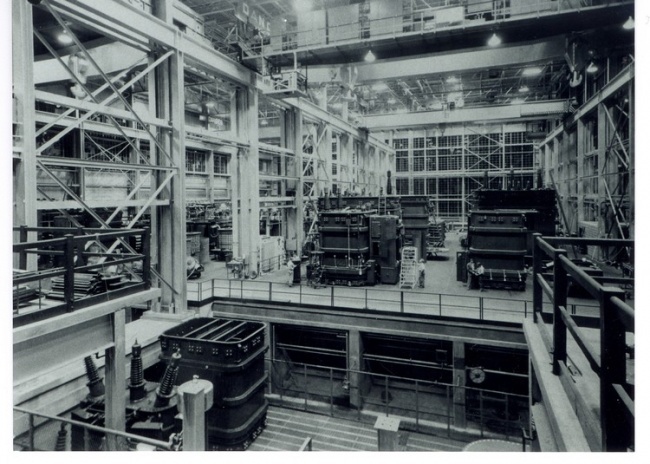 Concrete reactors were being manufactured in Building 7B. These had been developed in 1910 and consisted of air-core reactor structures supported by a poured concrete framework. They were (and still are) used primarily as current-limiting devices in power systems. One million volt Test Sets, each using three cascade transformers, were built for the G.E. Works in Philadelphia, and for Commonwealth Electric, a mid-west utility. The first Load Ratio Control was built. This device allowed transformer voltage output to be adjusted under load. The concept had been developed by G.E. engineers. Induction-type regulators were being manufactured in Building 19. This had been the case since 1912; from 1908 until 1912, they had been manufactured in Buildings 1-2-3, in the area known as the "hill" at the north end. The main Receiving Department for the plant was located in the basement of Building 42. This location allowed for direct access to the adjacent railroad tracks. Fan motors were being manufactured in a part of Building 43(along Kellogg Street). The Wire Department was located on Columbus Avenue in Pittsfield. 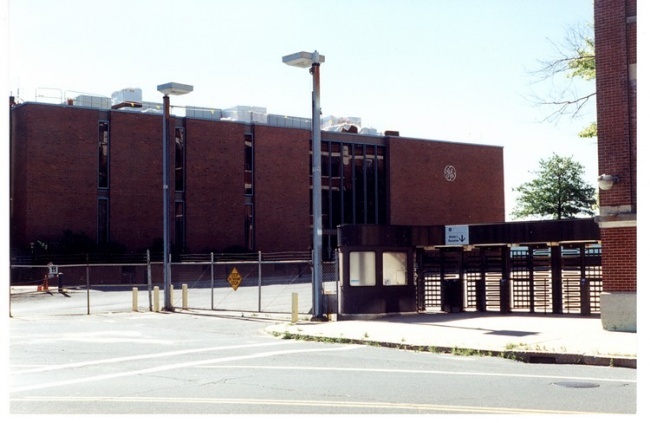 A new Laboratory facility was built; this was an addition to Building 8, known as "8-Ext". Capacitors were being manufactured in a part of Building 42. The Works Restaurant was now operating in a section of Building 43, known as "43B". A cafeteria for the "South Side" was operating in Building 27. The Power House was flooded to within one inch of the high voltage busses when Silver Lake overflowed! Edward Kopf graduated from the Pittsfield G.E. Apprentice Program, having joined it in 1923. Mr. Kopf has quite a few interesting recol-lections of life in the Apprentice Program, as well as the Pittsfield plant in general. 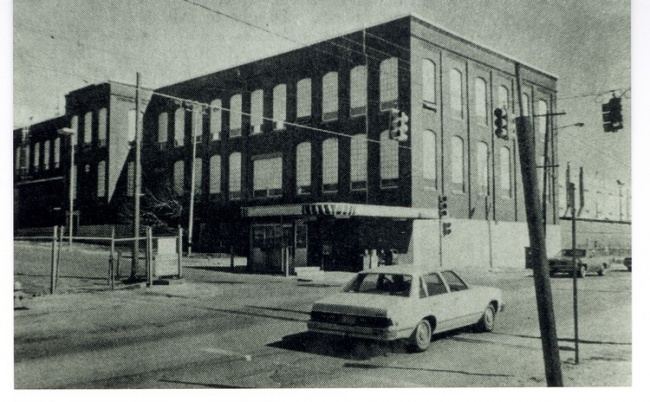 The Apprentice Program operated out of part of Building 26, located near East Street. It utilized two classrooms plus a fully-equipped machine shop, as well as two full-time instructors. Apprentices attended one two-hour class each working day. During the first year of the program, they learned how to operate every one of the machines in the shop. Then, they were sent to areas related to their particular line of interest: drafting, tool-making, pattern-making, maintenance, or engineering. There were both three and four year courses, and an entrance exam was mandatory. Apprentices were able to obtain experience working in any of the different departments in the plant: principally Power Transformer, Distribution Transformer, Regulators, Load Ratio Control, Foundry, Tool Room, Lightning Arresters, and Bushings. Starting pay on the four-year course was $9.60 per week for a 49-hour week. Exams were given every six months and, if passed, the Apprentice received a raise of two cents per hour! Subjects taught during the course included Mechanical Drawing, Shop Math, Trigonometry, Mechanics, Mechanisms, Strength of Materials, Gear & Cam Design, Advanced Trig, Electricity (both AC & DC), Tool Design, and Machine Design. Upon graduation from the course, each Apprentice received (personally) a large diploma from the Plant Manager. Also, in Ed Kopf's case, this diploma allowed him (in 1957) to obtain his Massachusetts License as a Professional Mechanical Engineer simply by taking a few night courses! 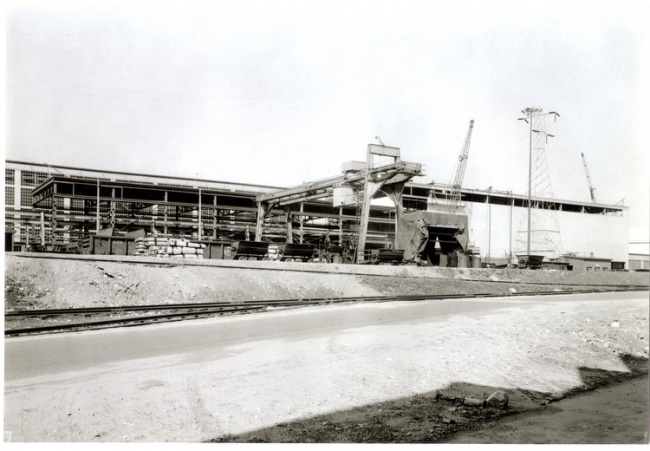 Other recollections of Mr. Kopf's include the fact that two small steam locomotives were used to haul materials around the plant in those days. 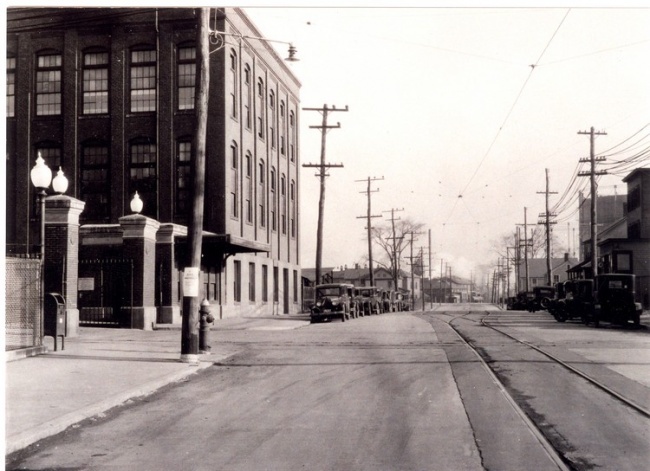 Tracks ran up the hill from South Gate (at East Street), over the railroad, and out North Gate onto Woodlawn Avenue; then back into the plant at Building 17 and on to the Tank Shop (Building 14). In the winter, when ice and snow were on the tracks coming up from South Gate, men had to run ahead of the locomotive with buckets of sand to throw on the tracks for traction! Sometimes, with big loads, both locomotives had to be used running in tandem. Also, during that era, the twelve to fifteen thousand employees in the Pittsfield plant received their pay in cash (no checks). 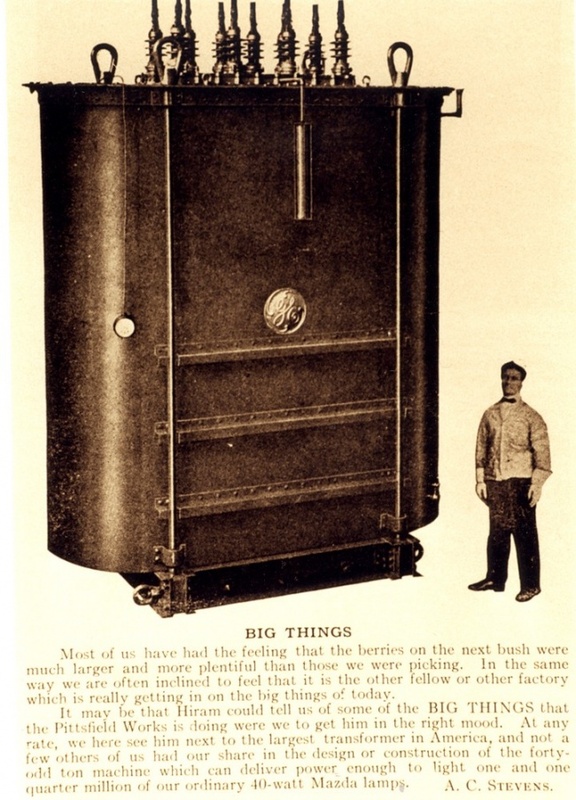 Money was picked up at the First Agricultural Bank in Pittsfield and brought to the plant in a large safe mounted on a flatbed truck. This was a battery-operated truck, and only enough charge was put into the batteries to make the trip to the bank and back again! Armed guards from the plant accompanied the truck, and additional armed guards from the bank were on hand for the loading of the money into the truck. The truck was driven into a freight elevator in Building 42 and taken up to the Payroll Department. Each department in the plant had a fold-up wire cage which was set up at a designated spot on pay day. The money was distributed to these various locations by other trucks. At each stop, the money and a payroll clerk were left in the cage. Pay envelopes were arranged by clock number, and it took only ten or fifteen minutes in each department to distribute all of the pay. "transformers, voltage regulators, cut-outs, current limiting reactors, heating devices, lightning arresters, capacitors, and single-phase motors." L.V. Bewley, world-renowned expert in surge phenomena and lightning-related disturbances on high voltage transmission lines, came to work at the Pittsfield plant from Schenectady General Electric. The first oscillogram of natural lightning was taken by personnel of the High Voltage Engineering Laboratory at Lake Wallenpaupack, Pa.
A major civic improvement in the vicinity of the Pittsfield plant was the paving of East Street! An article reported that an oil-filled transformer had burned up after seven years in service. However, inspection showed that the mid-western utility customer had never filled it with oil, and that the instruction manual was still hanging inside the tank!! 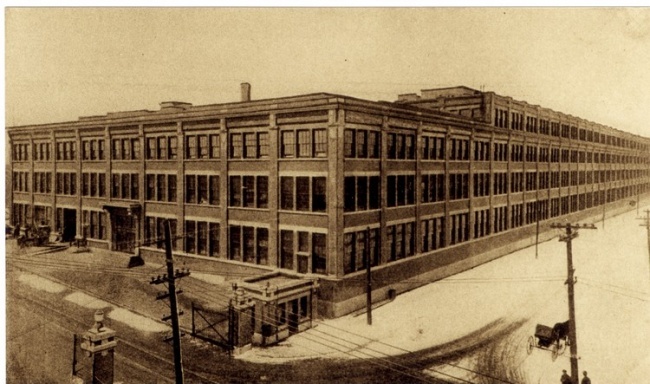 A new Building 34 was built, on the South Side of the plant near Silver Lake, which replaced an earlier building used mainly as a Pattern Shop for the adjacent Foundry in Building 33. The new Building 34 is still there. Nearby Building 36 housed the Molded Insulation Department. Silver Lake Boulevard was constructed around Silver Lake. Thyrite (G.E. trademark) was developed. This is a non-linear resistance material composed of a silicon carbide compound. It is used in lightning arrester and surge suppressor type devices to "clamp" over-voltages, but prevent the normal power system voltage from causing a current flow through it. The first commercial Impulse Test was performed on a transformer. This test simulates the effect of lightning-related surges which the transformer may be subjected to in service and demonstrates that the transformer insulation will withstand such mistreatment. Giuseppe Faccioli retires due to ill health. Building 62 is built south of East Street. This functioned as the Gas Plant, producing various types of bottled gas for use in production processes. A new Building 14 is under construction to replace the earlier Tank Shop. This was one of the first welded steel buildings in the country; prior to this, steel buildings were of riveted construction. The five-day work week was introduced, giving employees a full weekend off. F.W. Peek, Jr. becomes the Chief Engineer of the Pittsfield Works. The new Tank Shop (Building 14) is placed in operation; it includes a cafeteria. An Open House is held in June. Four network transformers are built for the Pittsfield Electric Company, and installed on West Street, Elm Street, Worthington St., and Francis Avenue in Pittsfield. The next chapter contains biographies of several of the notable professionals associated with the Pittsfield, plant over the years. Mrs. Irma Giegold, of Pittsfield, recalls that her father, Arthur Palme, was a friend and co-worker of all these gentlemen. Mr. Palme worked as an engineer from 1913 until his death in 1949. In particular, Mr. Palme was hired by Works Manager Cummings C. Chesney in spite of the fact that, at the time, Mr. Palme could not speak a word of English!, In fact, during World War I, he was restricted to his desk, the men's room, and the Works Restaurant because he was considered to be an "alien enemy". When he became a U.S. citizen in 1919, his co-workers decorated his desk with an American flag and threw a party. He was then finally given full access to "the shop"! Eventually, Mr. Palme received several patents. He was also well received by the shop workmen because. he spoke their language, which was predominantly Italian at the time. During Prohibition, he was often favored with gifts of homemade wine! Mrs. Giegold later became a Pittsfield G.E. employee herself. Once, her father "spirited" her into the High Voltage Laboratory to see a demonstration of artificial lightning which was being staged especially for then Governor of Massachusetts, James Curley. Guglielmo Camilli was a native of Rome, Italy; he received his engineering degree from the Royal Polytechnic School of Turin in 1922. In 1926, he began his career with General Electric as a Development Engineer in Pittsfield. In 1956, he was named Supervisor of Power Transformer Advance Product Engineering. By 1958, he had received a total of fifty-five patents, more than anyone else in the General Electric Company at the time. He was twice the recipient of the Coffin Award, the highest employee honor bestowed by General Electric. He was the author of a book on the subject of transformer engineering, and authored many technical papers throughout his career. Camilli was an avid amateur astronomer. He ground his own lenses and built his own telescopes. He was a member of the volunteer Pittsfield G.E. Speakers Bureau; as such, he presented a very popular talk around the country which was called "A Trip through the Universe". He predicted that the United States would reach the moon by 1967 (not far off!). He also used his immense knowledge of transformer insulation structures and cooling methods to design a "transformer for use on the moon" in 1955! He operated his own personal observatory at his home on East New Lenox Road in Pittsfield. In 1928, he constructed a home-brew television set for his own use. This was the first television of any type which was seen in Pittsfield. C.C. Chesney, a native of Pennsylvania, was born in 1863. Following his graduation from Pennsylvania State College in 1885, he taught mathematics and chemistry until becoming associated with William Stanley in 1888, in Great Barrington, Mass., as a chemist and engineer. He followed Stanley to the United States Electric Lighting Company in Newark, New Jersey (a subsidiary of the Westinghouse Company) in 1889. He then became associated with the Stanley Electrical Manufacturing Company in Pittsfield as an electrical engineer in 1891. He was the "C" in the S.K.C. system marketed by Stanley. In 1903, when the Stanley Company became a subsidiary of General Electric, Chesney was advanced to the position of Vice-President and Chief Engineer. In 1907, when the company became the Pittsfield Works of General Electric, Chesney was named Works Manager. He continued in this capacity until 1927 when he was named a vice-president of the General Electric Company. While with Stanley, he personally supervised the design of S.K.C. equipment, including the first revolving field type of alternator used in this country. Chesney was very active in local business activities as well as civic affairs. He was active in the Boys' Club of Pittsfield, and was a member of the Chamber of Commerce there. In 1921, he received the Edison Medal from the American Institute of Electrical Engineers, and he served as President of that organization from 1926 to 1927. The Edison Medal is the highest award given to an electrical engineer, and is for meritorious achievements in electrical science, engineering and art. Cummings Chesney retired in 1930 and died in 1947. He was survived by his widow, Elizabeth, four daughters, a son, and eleven grandchildren. Giuseppe Faccioli was born in Rome, Italy in 1877 and graduated with high honors from the Institute of Technology in Milan in 1899 as a mechanical and electrical engineer. He came to the United States in 1902 and obtained a position with the New York Edison Company (the ancestor of Consolidated Edison in New York City). One year later, however, he transferred to the employ of the Interborough Rapid Transit Company, the builders of the first subway system (the IRT) in New York City. Then, in 1904, he went to work for the Crocker-Wheeler Company in Ampere, New Jersey (near East Orange). Crocker-Wheeler had been building rotating electrical machines for the Stanley Company and, as a result, he came into contact with William Stanley. This led to his joining Stanley in Great Barrington (by this time, the Stanley Company in Pittsfield was a subsidiary of General Electric, and Stanley himself had gone back to Great Barrington to engage in other ventures). In 1908, Mr. Faccioli transferred to the Engineering Department of the Pittsfield Works of General Electric. In 1911, he was appointed Assistant Chief Engineer and, in 1914, he became Chief Electrical Engineer of the Pittsfield Works. In this capacity, over the years, he became intensely interested in high voltage power transmission work, and contributed heavily to the development of high voltage transformers and lightning arresters. He was very active in the American Institute of Electrical Engineers and was the author of highly technical papers on subjects such as electrical transients. Mr. Faccioli retired in 1930; by that time, he had been confined to a wheelchair for many years. A presentation in honor of his retirement was made at his home on East Housatonic Street in Pittsfield; this house still stands today. Mr. Hendricks was born in 1874 in Duchess County, New York State. In 1900, he completed a special three-year course at the Lawrence Scientific School of Harvard University. In September of that year, he entered the employ of the Stanley Electrical Manufacturing Company in Pittsfield where he worked on the assembly of switchboards and in instrument test. In 1901, he moved to the Morningside Plant of the Stanley Company in Pittsfield and spent a year in generator and transformer test. He then began to specialize in the areas of insulating materials, line insulator design, and the measurement of high voltage line losses. Between 1905 and 1911, he organized the testing laboratory, acting in the capacity of engineer of insulating material development. In 1906, he designed and built the first transformer devoted to the testing of insulation; it was capable of producing voltages up to 150,000 volts. In 1911, he transferred to the Transformer Engineering Department as a development engineer in the design of high voltage transformers and allied devices. Under his guidance, all of the transformers used in high voltage testing were designed, providing up to 1,000,000 volts three-phase and 1,500,000 volts to ground (single-phase). In 1922, he devised the 1,000,000 volt three-phase arc which remained a mainstay of public demonstrations for the next fifty years or so. He was also involved in the development of equipment such as high current testing transformers, cable testing apparatus, x-ray transformers, high frequency transformers, power and filament transformers for vacuum tube rectifiers, and air-blast type power transformers for use by the Interborough Rapid Transit Company of New York City (builders of the first subway system there). In later years, he was also intimately involved with the design of impulse generators for laboratory testing with simulated lightning surges. Dr. McEachron was born in Hoosick Falls, New York in 1890. He graduated from Ohio Northern University in 1913 with both E.E. and M.E. degrees. That same year he joined the General Electric Company as a student engineer on the test course. In 1914, he returned to Ohio Northern as an instructor in electrical engineering. In 1918, he became an instructor and research associate at the Engineering Experiment Station of Purdue University where he received an M.S. degree in Electrical Engineering. In 1922, he returned to G.E. to take charge of the research and development section of Lightning Arrester Engineering Development in Pittsfield. In 1933, he was appointed engineer in charge of the High Voltage Engineering Laboratory. In 1945, he was appointed Assistant Works Engineer. In 1947, he was named the Assistant Manager of Engineering of the Transformer and Allied Products Division. In 1949, he was appointed Manager of the TAP Division. He received the appointment of Manager, Laboratory-Engineering Department in 1952, and, in 1953, was named as the Consultant of Professional Employee Relations for all technical employees in the Engineering Services Division of the General Electric Company. He originated and supervised the lightning investigation at the Empire State Building which yielded a vast amount of valuable data on natural lightning. Also, under his direction, 10,000,000 volt discharges were produced by impulse generators at the 1939 New York World's Fair, and the new High Voltage Laboratory building (Building 9) was opened in Pittsfield in 1949. Dr. McEachron was a recognized authority on lightning, world-wide. He was often called upon to testify in cases of lightning-caused injuries and damage. In 1940, he coauthored the book "Playing with Lightning", and, in 1948, he wrote the article "Lightning and Lightning Protection" for inclusion in the Encyclopedia Britannica. He was also the author of many technical papers on the subject of lightning and related topics. W.S. Moody was born in Chelsea, Mass. in 1864. In 1887, he graduated from M.I.T. with a degree in Electrical Engineering. He then became an instructor in physics and electrical engineering at M.I.T. In 1888, he became an assistant engineer at the Thomson Electric Welding Company in Lynn, Mass. This company was started by Elihu Thomson of the Thomson-Houston Electric Company (Thomson was the inventor of the electric welding process). In 1892, The Thomson-Houston Company was merged with the Edison General Electric Company to form the present General Electric. Mr. Moody then joined the Thomson-Houston Company in 1892, the year of the merger. After General Electric was formed, he became the Chief Engineer of the Lynn Transformer Works of General Electric. In 1897, he moved to Schenectady and assumed the same position at that plant. In 1908, after the Stanley Company had become the Pittsfield Works of General Electric, Mr. Moody moved here to continue his career. He came to be known as a pioneer in transformer design, and he retired as a Consulting Engineer in 1931. Among his accomplishments included the design and development of the extremely successful Type 'H' distribution transformer, a basic design for air-blast type transformers, and, perhaps most notably, the development of a practical process for rolling silicon steel to be used for the construction of low loss transformer cores. Mr. Moody died at home in Pittsfield in 1938, at the age of seventy-four. Konstantin K. Paluev was born in Russia in 1894 and was educated as an engineer at the Polytechnic Institute of Peter the Great in Petrograd. He came to this country in 1916 as a representative of the Czarist government to inspect United States ammunition bound for Russia. He often declared that the Russian Revolution "set him free" in this country. He came to the Pittsfield G.E. plant in 1919, and his contributions to the design of transformers were enormous. Paluev was responsible for the development of the "non-resonating" winding configuration in transformers. This was a way of designing windings with electrical_ characteristics such that they would be much less susceptible to the very high surge voltages produced by lightning strokes. He accomplished this in the 1920's, and it was the only way in which transformers were able to be designed for operation at voltages as high as the upper voltage limit at that time, which was 230-Kv. In 1930, he played a leading role in the development of forced-oil cooling for large power transformers. This development was to be of great advantage in the design of large, high power transformers needed for various aspects of the war effort during World War II, as well as the large capacity transformers needed during the post-war period. He was noted for his belief in the doctrine of "collective genius". This concept dealt with the ability of a group of people, in a free society, to be able to accomplish far, more than their individual talents would indicate was possible. He considered this to be the prime reason for American productivity and inventiveness. Paluev died in 1958, at the age of sixty-four, in Pittsfield General Hospital a month after having received a severe electrical shock. F.W. Peek was born in California in 1881. He graduated from Leland Stanford University in 1905 with a Bachelor of Arts degree, and from Union College in Schenectady with a Master's Degree in Electrical Engineering in 1911. He entered the employ of the General Electric Company in 1905 as a test man in Schenectady. A year later, he was placed in charge of special testing in engineering research. Mr. 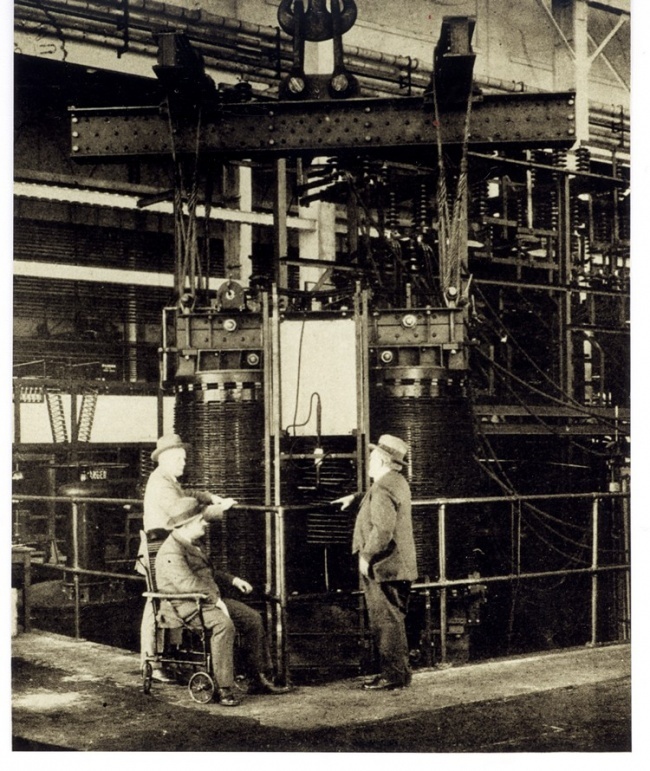 Peek became interested in high voltage research about 1906, when this was a very new subject. Funding was hard to obtain, so he set up a laboratory in an old boxcar in a remote corner of the Schenectady G.E. plant. Periodically, he would discuss the results of his work with the famous G.E. scientist, Dr. C.P. Steinmetz. In 1909, he was one of the first young engineers to join the newly-formed Consulting Engineering Department of the G.E. Company, under Dr. Steinmetz. In 1916, Mr. Peek was transferred to Pittsfield where high voltage research work was underway. Soon after Dr. Steinmetz built his first lightning generator in Schenectady, Mr. Peek was building similar machines in Pittsfield, but at ever increasing voltages. In 1931, Mr. Peek was named Chief Engineer of the Pittsfield Works, succeeding Giuseppe Faccioli who had recently retired due to ill health. Very unfortunately, however, Mr. Peek was killed in an automobile accident while travelling on vacation in Canada in 1933; he was fifty-two years old. There was not much specific mention of the Depression in the Pittsfield G.E. News during this period of time. However, in 1930, G.E. President Gerard Swope instituted an Emergency Unemployment Fund. This was funded by a compulsory one percent contribution from all employees' salaries, and was matched by G.E. It was started in response to the "present unemployment emergency". In 1934, publication of the weekly newspaper-style Pittsfield G.E. News began, and continued in that format through the plant closing in 1987. Both Pathe and Movietone News made newsreels of a new high current generator located in Building 12A; this device was built in order to study the destructive effects of current in natural lightning strokes (up to 250,000 amperes!). Eleven transformers were built for the new Boulder Dam (later, Hoover Dam) powerhouse on the Colorado River between Arizona and Nevada. This was a one million dollar order! One hundred and fifty boilers for G.E. oil furnaces were built in the Tank Shop for Mount Holyoke College in South Hadley, Mass. A new Visitors Reception Room was opened in Building 42. A lightning observatory was built on the roof of Building 43. 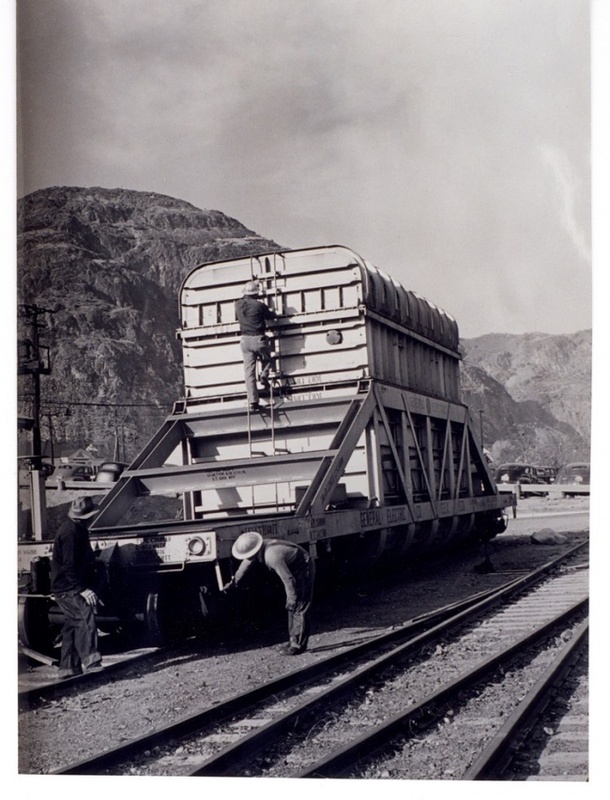 The first Boulder Dam transformer was shipped. A Relief Loan Plan for needy workers was approved by plant employees. A new auditorium was opened in Building 16. The Stanley Club presented a concert by the Pittsfield Symphony Orchestra at the Masonic Temple in Pittsfield. Coils for a new Cyclotron ("atom-smasher") at the University of Rochester were being built in the Pittsfield plant. The Golden Jubilee of the Stanley transformer of 1886 was celebrated with festivities at Pittsfield High School. An early version of a forced-air cooled type of transformer was built for the Consolidated Gas and Electric Company of Baltimore, MD_ An external blower was used, rather than fans as became the later standard practice. This was an oil-filled transformer; "air-blast" dry type transformers had been in use for many years by this time. A Test Man in Distribution Transformer Test was electrocuted from accidental contact with a 7200-volt circuit in Building 26. The Stanley Club moved into new quarters at 54 Wendell Avenue in Pittsfield. The main house was known as the Hinsdale Mansion, and a carriage barn on the premises was converted into an auditorium. The purchase price of the property was $16,500, and the plan was to pay for it by raising the annual dues from $8.00 to $12.00! Eventually, the main house was sold and the carriage barn became the Stanley Club. An unfortunate record was set by the occurrence of seventy-five lost-time accidents for the year. Also, in 1936, thirty Pyranol network transformers were built for the New York and Queens Electric Light and Power Company in New York City. The vast majority of transformers built in Pittsfield were filled with mineral oil (known as Transil or "10C" oil) which acted as an insulating fluid as well as a heat-conducting fluid. However, as with other petroleum products, it suffered from the disadvantage of being flammable. By 1932, the Monsanto Chemical Company, in conjunction with F.M. Clark of General Electric, had developed a synthetic fluid which had insulating and heat conducting properties similar to mineral oil, but was not flammable. Thus, it was put into use for transformers which had to be installed in locations where fire would have devastating consequences; these included tall buildings and under-street vaults in large cities, as well as on electrically-powered passenger trains. The chemical mixture was known as Pyranol (a G.E. trademark) and its two constituent parts, a resin and a solvent, were shipped in separate railroad tank cars to the Pittsfield plant. The mixing of these two components to form the Pyranol fluid took place in Building 12G. This building was located to the east of Building 12Y, and was razed during the construction of Building 100, in 1966. Pyranol contained a large proportion of "PCB's", or poly-chlorinated biphenyls. By 1977, it had been determined that PCB's in high concentrations could cause the development of cancers in laboratory animals. Thus, the use of Pyranol was discontinued. As of this date, however, a definite link between PCB's and human cancer has yet to be proven. While Pyranol was in use in the Pittsfield plant, great care was taken to insure that it would not be accidently mixed with the "10C" oil which was used in the majority of transformers built. This was because it had been determined that Pyranol had a very destructive effect on some of the insulating materials which were used in oil-filled transformers; particularly the glues and other binders used to hold together paper-type insulation structures. Also, while Pyranol was a good insulating fluid, it had been found that it was not capable of insulating against voltages higher than about 200 kilovolts. Since large transformers were often designed to operate at voltage levels significantly higher than this, Pyranol was of no use for these designs. 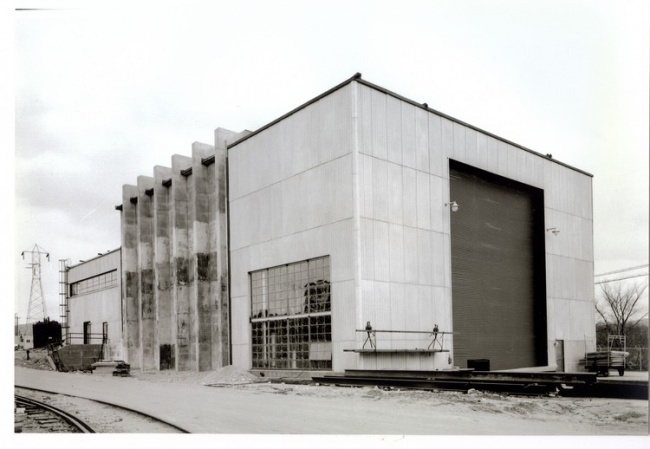 Accordingly, Pyranol was kept completely out of the new transformer assembly building (Building 100) when it was put into operation in 1968, since the largest and highest voltage transformers were built there. The Pittsfield G.E. Plastics Operation moved from a location on East Street to "the old porcelain plant" on Ceramic Avenue. The Employees' Store moved into new quarters in Building 42. Elihu Thomson died at the age of eighty-four. He was the guiding force behind the Thomson-Houston Company of Lynn, Mass, which was combined with the Edison General Electric Company in 1892 to form the present General Electric Company. 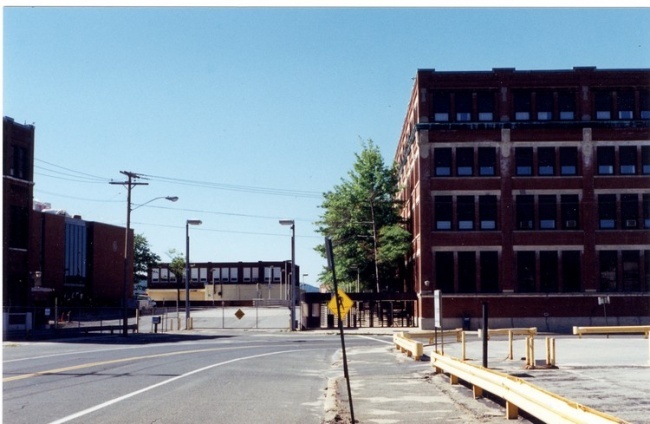 The Thomson-Houston plant in Lynn eventually became the Lynn Works of G.E. Pyranol railway transformers. 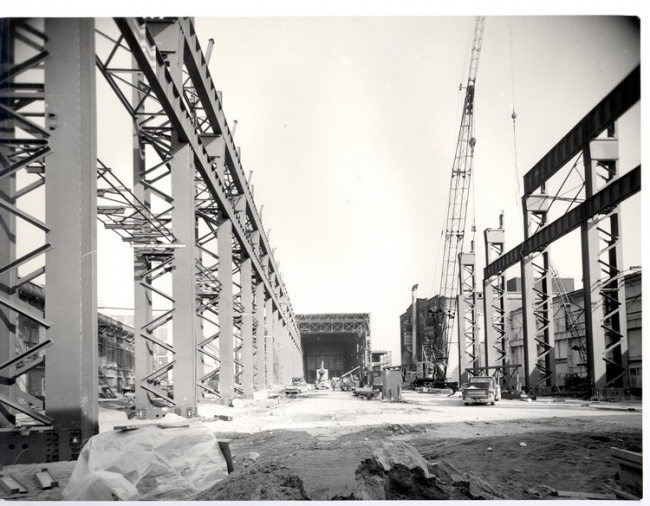 were being built for both the Pennsylvania Railroad and the New York, New Haven and Hartford Railroad. 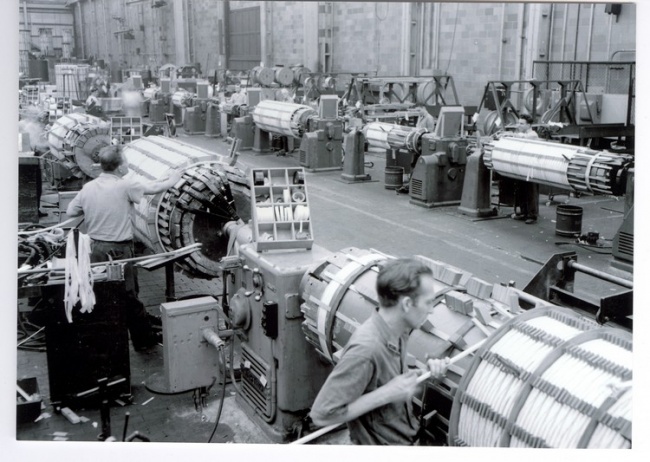 Cyclotron coils were being built for Harvard University. Last year's record for lost-time accidents was broken: eighty-one this year! A wound-type core, called Spiracore (G.E. trademark), was developed for use in small distribution transformers. L.V. Bewley, noted G.E. theoretician, was to teach a course on "Symmetrical Components", a method of calculating three-phase circuit behavior. A G.E. ad brags about the fact that the United States, with only 1/15 of the world's population, uses 1/3 of the world's electric power and has 3/4 of all of the automobiles in the world! A photo in the G.E. News shows the impulse generator used for the G.E. exhibit at the 1939 New York World's Fair; this generator was used to produce artificial lightning discharges in Steinmetz Hall at the Fair. Excursion trains were being run from Pittsfield to the World's Fair in New York City. A new Display Room for transformer products Was opened in Building 16. The plant Photo Department was in Building 10. An addition to Building 14 (the Tank Shop) was begun. October 5 was "G.E. Day" at the World's Fair! A building at One Plastics Avenue was begun for the production of Textolite, a trademark G.E. plastics material. Also, just across the street, the "National Defense Building" was begun; this was the beginning of what would become the Pittsfield G.E. Naval Ordnance Department. The Capitol Theatre in Pittsfield was pre- viewing the new film "Edison, The Man". In the interest of national security, nothing was published in the Pittsfield G.E. News regarding any involvement in technical activities related to the war effort, on the part of the Pittsfield G.E. plant. However, Harry Mason, a former Design Engineer in the Pittsfield transformer operation, has some interesting recollections of this era. Most notably, he was involved in a special project which included the design and manufacture of a large quantity of special transformers for use in the Manhattan Project, which led to the development of the atomic bomb. These were rectifier transformers which were shipped to Oak Ridge, Tennessee. They were used in conjunction with rectifiers to produce direct current needed to accelerate uranium ions through a strong magnetic field. This would then separate fissionable U235 from U238. In order to assemble these units, a special enclosure was built at the north end of Building 3 (inside of the building itself). It had only one entrance and armed guards were stationed both inside and out at all times! The rectifiers themselves utilized vacuum tubes which were eighteen inches in diameter and thirty-six inches long; they were water-cooled. One such rectifier unit was completed per week. Harry remembers an airplane trip to Berkeley, California (eighteen hours in a DC-3!) where the famous physicist, Dr. E.O. Lawrence, was using some prototype transformers in uranium ion separation experiments at the University of California. Harry later spent six weeks at Oak Ridge during the initial use of the pro-duction transformers there. As an interesting aside to this, George Sauer, formerly of Power Transformer Engineering, remembers that the first of the Oak Ridge units into Test suffered a flashover of one of its porcelain bushings. This created somewhat of a crisis due to the impending need for these transformers; as a result, a great deal of "rush" bushing development work was created for the G.E. High Voltage Laboratory in the Pittsfield plant. This, in turn, created lots of draft deferments for the men who were involved in this work! In addition, Ed Kopf (see "1927" in Chapter 3) recalls an incident in which a worker from this project was being much too loose-lipped on his way to lunch one day. While walking to a restaurant on Woodlawn Avenue near the plant, his conversation was overheard by a Government man walking behind him. He was stopped and was taken to the Chief of Plant Protection who proceeded to deliver a very strong admonition to watch his mouth from then on! Apparently, he had guessed at the intended use for the power supplies which he was working on, as being part of the atomic bomb development work. 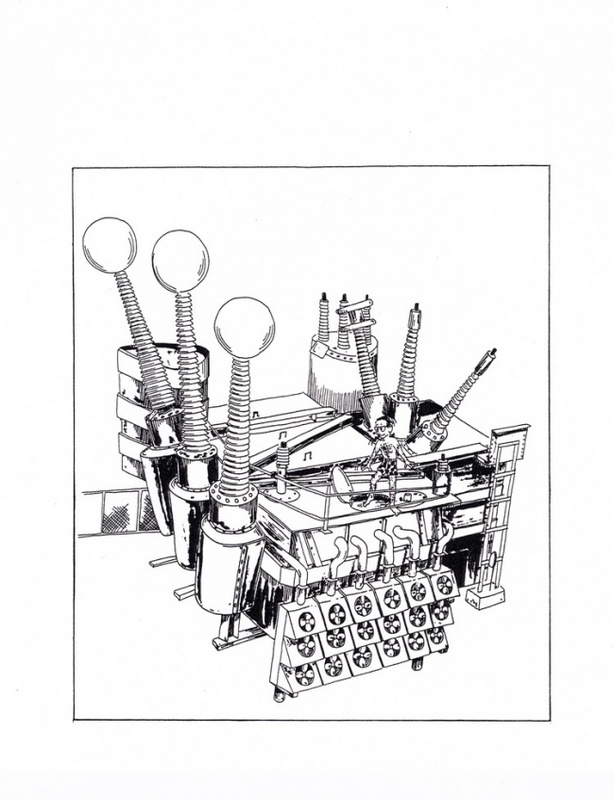 According to Ed, very few people ever saw the complete drawings for these power supplies; copies of them were cut up and the individual sections were distributed to the particular workers who needed them. Each section was given a serial number and was signed for when taken out. Thus, it had to be returned at the end of the shift. The drawing sections not in use at any given time were kept locked in the office safe. In the realm of miscellany, Harry Mason recalls that the older engineers during this time had their own personal spittoons on the floor next to their desks! They were filled with water and would be emptied every night by the janitor. A new G.E.A.A. facility opened on Crane Avenue in Pittsfield. An expansion of the Power House was begun. The last steam locomotive switcher used in the plant was scrapped; a new diesel switcher was purchased from the Erie, Pa. G.E. plant. A new addition was made to the "Foundry. Building" (Building 33 on the South Side). A new vacuum tank, used to "treat" transformer core and coil units to remove moisture, was installed in Building 12-Ext. A rush transformer order was received from ALCOA (Aluminum Company of America). The Pittsfield plant guards were armed! In 1942, due to a critical shortage of copper, twelve transformers were built at the Pittsfield plant which had silver windings! These were 12,500 Kva, 138-kv units needed for an aluminum reduction plant at Maspeth, Long Island which was operated by ALCOA. The silver came from the United States Treasury vaults at West Point, NY. Seventy-five tons of silver, valued at almost one million dollars in 1942 currency, were used. The silver was, and remained, the property of the U.S. Treasury. Because of its high value, extraordinary precautions were taken during its transportation and handling. Each 25-ton railroad carload of silver travelled to Pittsfield escorted by U.S. Treasury guards armed with machine guns. Other Treasury guards were present during all fabricating operations, and all scraps of silver had to be accounted for. Since it was desired to eventually reclaim the silver, a plan had been developed providing for later disassembly of the transformers to replace the silver with copper. The transformers were built on a rush basis, passed all tests, were shipped on schedule, and remained in service for a year and a half. An extension was begun at the east end of Building 14 (the Tank Shop). A list of names was published in the Pittsfield G.E. News for the purpose of car pooling. This was noted as being the result of "a reduction in gasoline allotments, in this area". Car pooling was encouraged, but was in no way compulsory. Stators for large ship propulsion motors were being built at the Pittsfield plant. The Amplidyne was developed by E.F.W. Alexanderson of Schenectady G.E. Alexanderson had been instrumental in the development of large high frequency alternators for "wireless" communication before World War I. 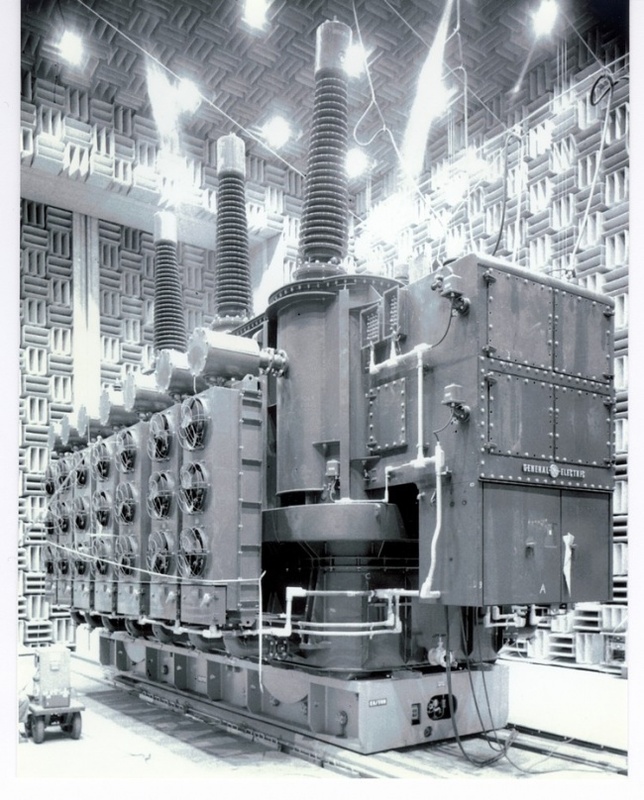 The Amplidyne D.C. control generator eventually found extensive use in the precise control of voltage from generators used to test transformers in the Pittsfield plant. A play review of “The Eve of St. Mark" was printed in the Pittsfield G.E. News. This was performed by the Town Players of Pittsfield, a local amateur group, at the auditorium in the Berkshire Museum on South Street in Pittsfield. George Sauer, then a transformer design engineer, was included in the cast. An extension to Building 63, located south of East Street, was begun. The G.E. facility on Columbus Avenue in Pittsfield was referred to as "Building 81". Sam Sass was appointed Librarian for the William Stanley Library in the plant; Sam served in this capacity until 1976. Radar modulation transformers were being built in Building 26. A new Building 12B was constructed; it was to be used for short-circuit testing of coils and other transformer components. The first plant Open House in nineteen years was held. A second extension on the east end of the Tank Shop (Building 14) is begun. High voltage bushings are now being built in Building 17. The Columbus Avenue plant is now the Industrial Heating Division. An addition to Building 15 is underway. The High Voltage Laboratory (Building 9) is under construction. The old Power House smokestack was torn down. Thomas Scorpa was electrocuted in the Test operation associated with the manufacture of capacitors. 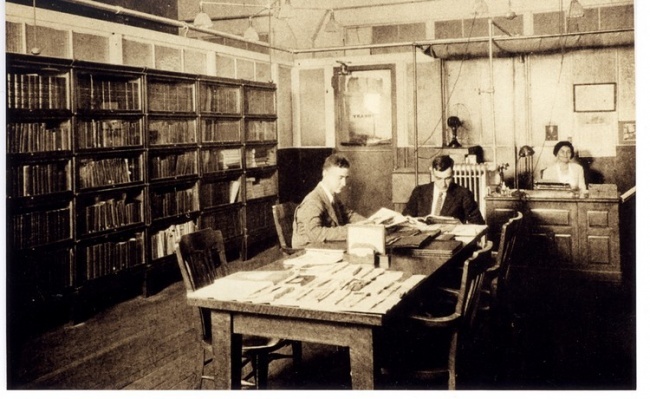 The Stanley Library moved to new quarters in Building 8 (see "1923"). A new Power House smokestack was built. The world's largest overhead rolling door was installed in the rear of Building 9. Building 9B was under construction. The Building 16 auditorium was renovated. Another Open House was held. The High Voltage Laboratory opened. 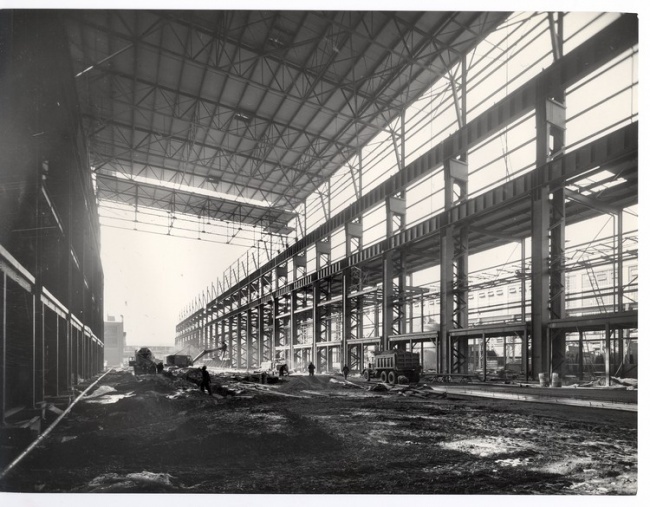 Building 12Y was under construction; it was to double the capacity of the plant. 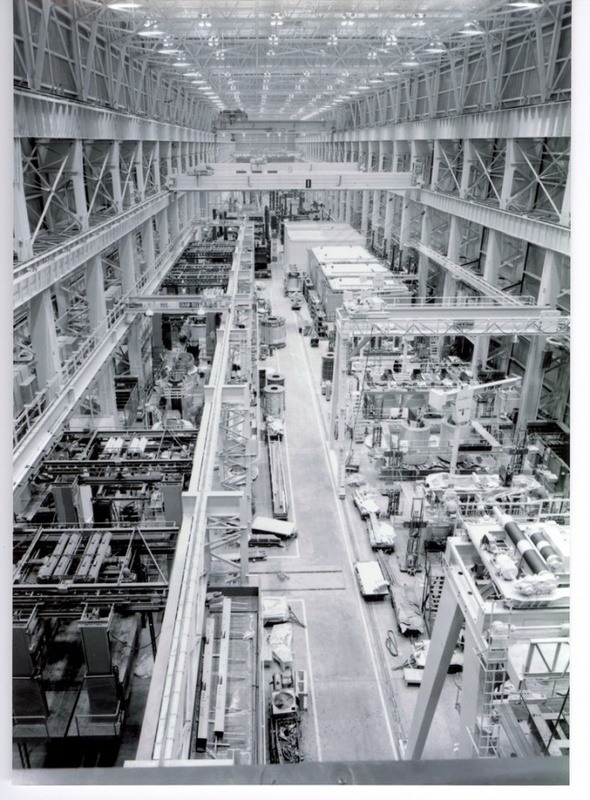 The construction of Building 12Y doubled the plant's capacity for the production of large transformers. 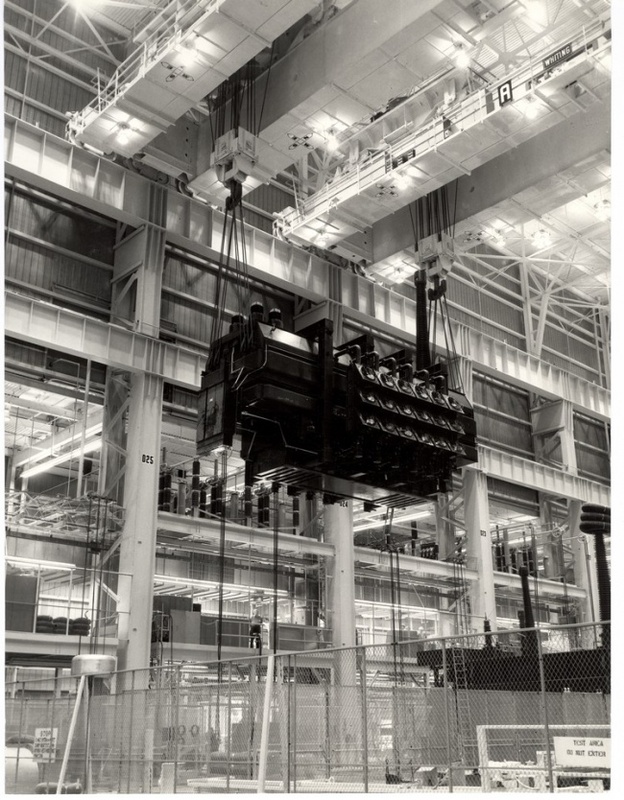 In 1968, the opening of the cavernous Building 100 further increased capacity in order to assemble and test the huge transformers which had become commonplace in the electric utility industry by that time. Building 12Y is put into operation. A 7500-kilowatt mercury turbine unit is placed in operation in the Power House. An overhead conveyor is built between Building 26 and Building 33 on the South Side. This conveyor spanned the main plant entrance from South Gate on East Street and, for many years after its construction, it was used to display safety-related messages. An old Stanley Electric Manufacturing Company safe was removed from Building 41! 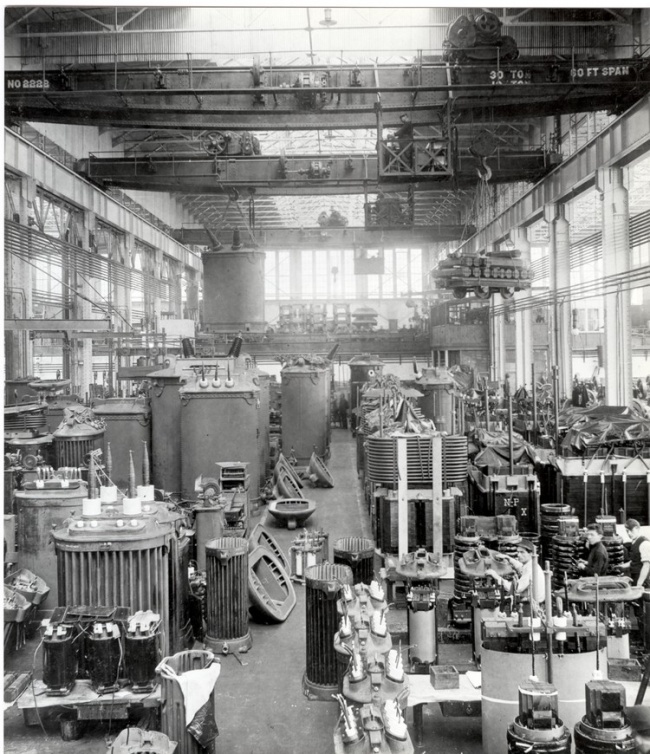 The "TAP" (Transformer and Allied Products) Laboratory was formed; also, what had been known as the High Voltage Engineering Laboratory became simply the High Voltage Laboratory organization. 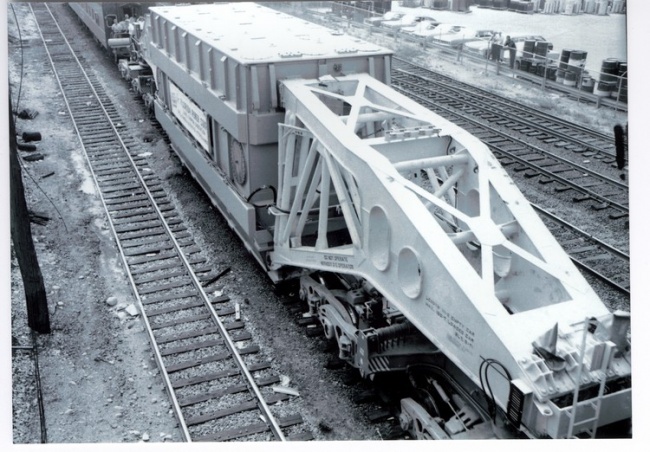 A "drop frame" railroad car for shipment of the largest transformers was designed by the New York Central Railroad. A new plant for the manufacture of medium-sized transformers was opened in the city of Rome, Georgia. New construction was underway at Buildings 51A, 65, and 66. 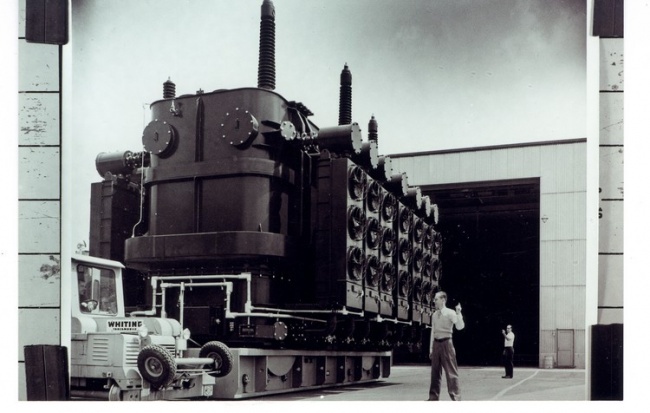 A record-size auto-transformer was built for an atomic plant at Paducah, Kentucky. It was rated at 156-Kva, 230/138-kv, and it weighed 235 tons. A new Sound Test Lab (Building 12T) is to be built on the site of what was known as "Jones' Shed" (Building 12D). Building 14H, called a "million dollar project", is under construction. This was the fifth addition to the 1931 Tank Shop: 1941 - southwest addition (14W), 1942 - first east addition (14-Ex), 1947 - second east addition (14-2Ex), 1947 - northwest extension (14NW), 1953 - Bldg. 14H and "plate yard"
The Power House coal trestle was rebuilt. An Open House was held. 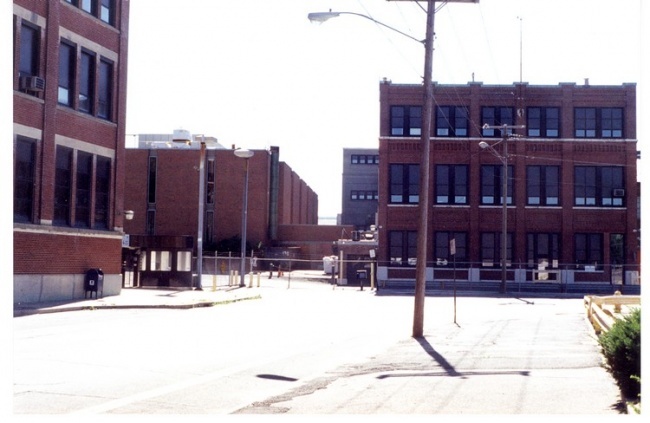 The Columbus Avenue plant was manufacturing Calrod heating units. An addition to Building 15 was underway. An early computer, an IBM "card-programmed calculator", was installed in Building 16. Transformer design programs for it were written by Pierre Abetti and Stan Williams. Some of the design engineers felt challenged to come up with transformer designs faster than it could be done by the machine. They soon learned, however, that it could not be done! The engineers submitted stacks of punched cards to be run in "batch" mode. Some years later, however, Bill McNutt, a design engineer, was allowed to work interactively on the machine at night to develop standardized designs of transformers for use in the customer proposal stage of the transformer marketing procedure. Building 7J was added to the south side of Building 7D. This new addition was for the purpose of housing a 175-ton motor-generator set used to provide power to the test berths in Building 12Y. The Stanley Club vacated the mansion which it had occupied on Wendell Avenue in Pittsfield since 1936. The entire club operation moved into the "carriage house" at the rear of the property. A new 100-ton crane was installed in Building 3. Buildings 7, 8, and 9 were all occupied by various factions of the plant Laboratory. A new boiler and smokestack were added to the Power House. A nationwide hunt for old transformers which were still in service yielded a Stanley unit dating from 1902! 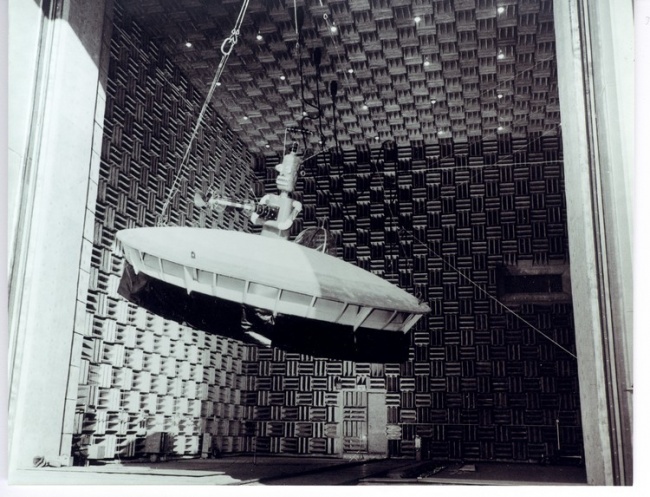 Building 12T, an anechoic chamber for audible sound testing of large transformers, was dedicated. This is a poured concrete structure which still stands to the east of Building 12Y. A special railroad track was run between this building and. Building 12Y to transport the transformers via a "donkey" locomotive. Ronald Reagan, then known as the host of the "G.E. Theatre" on television, visited the Pittsfield plant. Planning was underway for a new plant to manufacture distribution transformers in Hickory, North Carolina. A new Gas Plant which used electrolytic cells to manufacture hydrogen and oxygen went into operation on New York Avenue. The fifth Open House was held (previous ones were in 1927, 1946, 1949, and 1953). The largest transformer built to date was rated at 300-Mva. The G.E. facility on Columbus Avenue in Pittsfield was sold. A television commercial was filmed at the High Voltage Laboratory (Building 9) to be aired during the popular "G.E. Theatre" series. The advertisement featured Don Herbert, then known as television's "Mr. Wizard". The feature presentation to be shown was called "Steinmetz" and starred Franchot Tone. 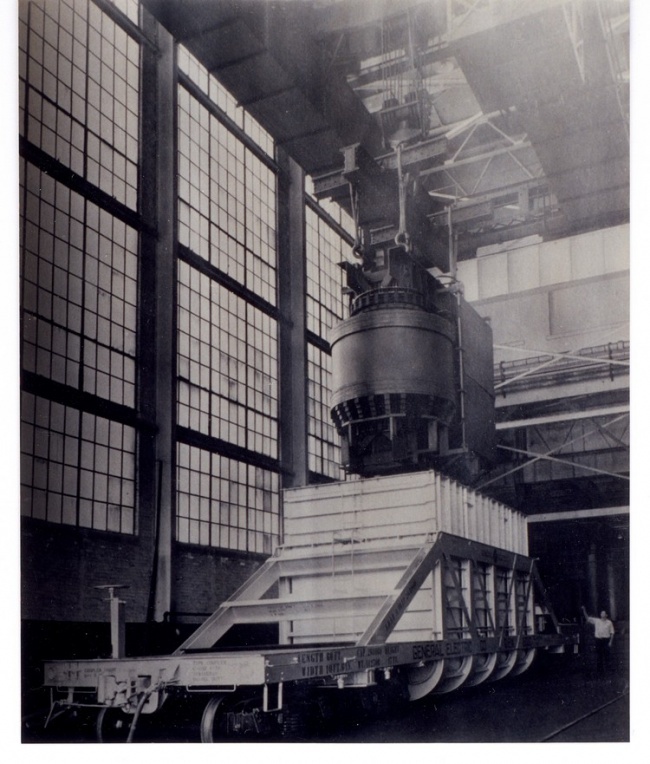 The largest transformer built to date was for Detroit Edison and was rated at 360-Mva. An IBM 705 computer ("the size of a small house") was installed in Building 17. This was the first general purpose computer in the plant (the earlier "Card-Programmed Calculator" was rather specialized), and Pierre Abetti was placed in charge of its operation. A new six-operator telephone exchange ("PBX") was installed in Building 16. A gas-insulated transformer, designed by Guglielmo Camilli, was built for the Consolidated Edison Company of New York City. Camilli had begun research on such a device in 1937. It was rated at 2-Mva. Building 16 had to be evacuated in order to begin necessary repairs to rusted wall truss-units! Building 36 blows up! This was a phenolic resin operation near Silver Lake. A resin pot had been over-pressurized and the resulting explosion destroyed one end of the building, throwing chunks of debris into Silver Lake. Molten resin was spewed over everyone and everything! Two people were killed outright and a third died later of injuries. Two years later, in response to a letter, the Pittsfield G.E. News claimed that the actual cause of the disaster had never been determined. A second gas-insulated transformer was sold to Consolidated Edison, and a third one to Pennsylvania Power & Light in Allentown, Pa.
A new safety slogan was placed on the overhead conveyor between Buildings 26 and 33 on the South Side. It said "Accidents Happen Fast - Think First, Not Last" and it remained until the conveyor (and Building 26!) were torn down in the 1980's. "The Castle" in nearby Lenox, Mass. opened. This served as housing for young, unmarried G.E. professionals for many years thereafter. The plant cafeteria in Building 25 was closed. It was replaced by Canteen vending machines, a source of complaints until the plant closed in 1987! Two power failures shut down the plant! The first shut down the entire plant for about an hour. It was caused by a short circuit in a circuit breaker located in Building 32S near the Power House. This was the first plant-wide power failure in the fifty-four year history of G.E. operation. In addition, there was a 12-hour delay in restoring power to the South Side which resulted in a lost work day for one thousand workers. Two days later a second plant-wide power failure occurred! This was due to a cable failure, again in Building 32S. It was most likely somehow related to the event two days earlier. This time, however, the consequences were much more severe. This breakdown placed a short-circuit on one of the transformers at the Silver Lake Substation which tied the plant power system to that of the Western Massachusetts Electric Company. The transformer burst into flames and, for whatever reasons, circuit breakers tripped as far away as Greenfield, Mass. to the east and North Greenbush, NY to the west! As a result, 85,000 residents in Berkshire County were without power for about twenty minutes, and service was disrupted as far away as Savoy and Sandisfield, Mass. At the Pittsfield plant, one thousand workers were off the job for five days while the necessary repairs were made. It was decided that the plant whistle would no longer be used to signal shift changes. A new gate house was built at North Gate, the main entrance to the plant. This structure was torn down in 1981 when turnstiles were installed (activated by I.D. cards). The G.E. Credit Union moved into the space recently vacated by the elimination of the plant cafeteria (Building 25). The Atmoseal (G.E. trademark) system of oil preservation in large transformers was introduced. 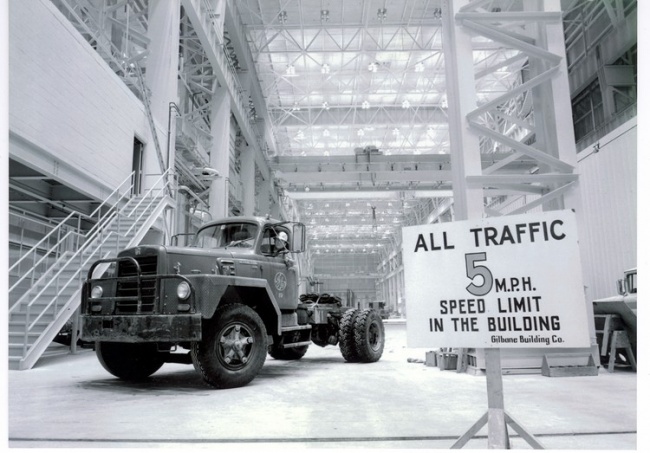 A pioneering nuclear generating station at Dresden, New York went into operation using two Pittsfield-built G.E. transformers. 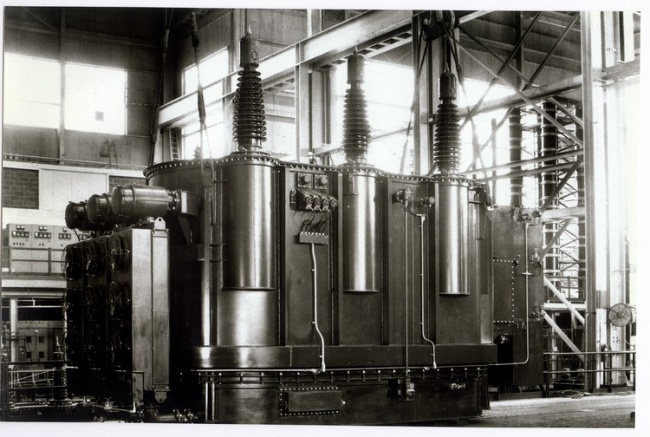 A 25-Mva transformer was built for use at the Doreen Street substation in Pittsfield. An announcement was made of the construction of Project EHV, an elaborate research and development facility, in nearby Lenox, Mass. "EHV" stood for "extra high voltage". 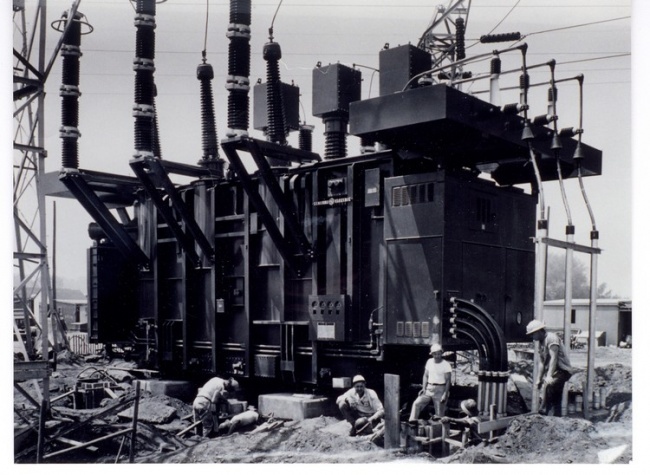 The largest transformer built to date was for Commonwealth Edison (Chicago area) and was rated at 375-Mva. G.E. announced that it intended to reinvest forty-seven million dollars in the Pittsfield plant. A no-strike vote is taken by the local labor unions. Building 10, of 1902 vintage, is torn down. The G.E. Meter Department in Somersworth, New Hampshire is added to the Transformer Division of the company. The Jimmy Dorsey Orchestra played at the Stanley Club! A 1907 vintage Stanley-G.I. two-phase crane motor was retired in Building 2. 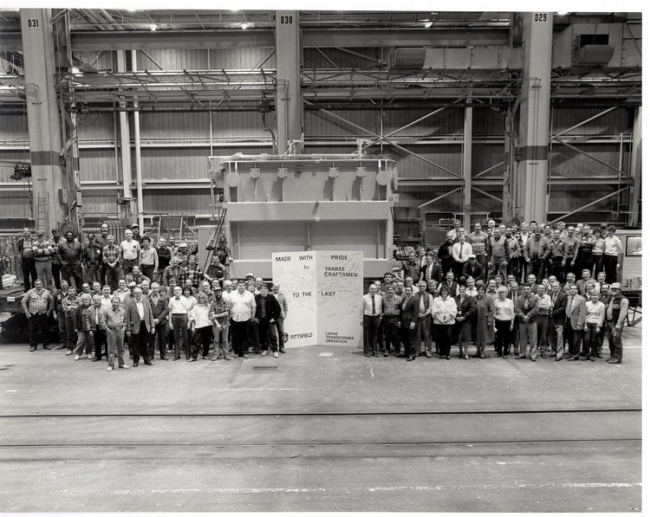 The largest all-aluminum transformer in the world was built for ALCOA in Massena, NY. It was rated at 20-Mva, had an aluminum tank, and utilized an aluminum sheet winding made of sixty-inch wide foil. The local IUE labor union voted a two-week strike. The physically largest transformer built to date was a 208-Mva, 417-ton phase-shifter for the Consolidated Edison Company; it was installed in Brooklyn, New York. The Project EHV "North Station" on East New Lenox Road near Pittsfield was begun. An explosion and subsequent fire occurred outside of Buildings 12A and 12B during short circuit development tests on a voltage regulator unit. A 400-Mva transformer was ordered by the Public Service Electric & Gas Company of New Jersey. A pellet-type lightning arrester for home, use was developed in Pittsfield. The largest porcelain bushing ever built was for use at Project EHV. It measured twenty-eight feet in height. 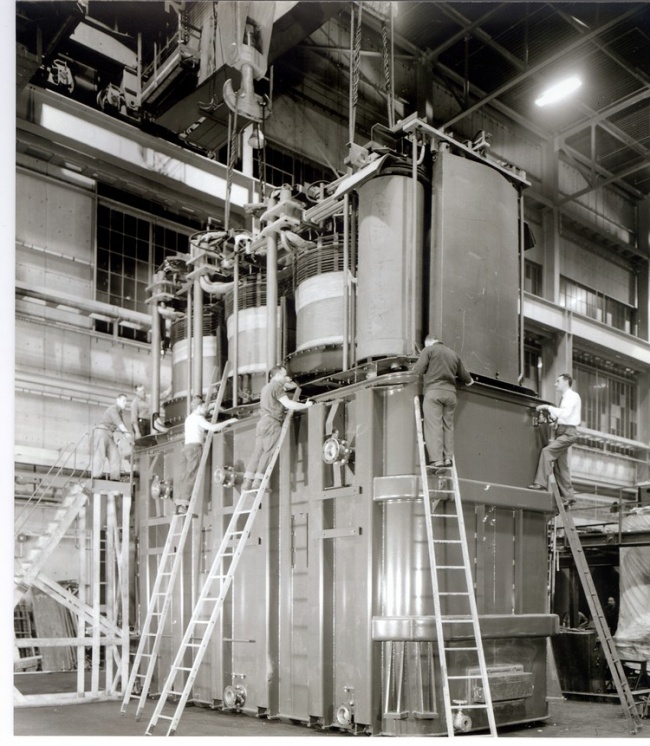 A 115-ton air core reactor was built for use with an Atomic Energy Commission proton accelerator at Princeton, New Jersey. The IUE voted a twenty day strike. Project EHV was energized at 720-kv, or 720,000 volts. Westinghouse announced construction of a new plant in Muncie, Indiana for the manufacture of large power transformers, like those G.E. builds in Pittsfield. A price-fixing scandal led to seven out of forty-four power industry executives who had been indicted for violation of the Sherman Antitrust Act being sentenced to prison terms! Some Pittsfield G.E. executives were caught up in this action because it involved the fixing of prices for transformer products. The seven jailed officials also paid fines totaling $137,500, and the remaining indicted officials paid fines which totaled $1,924,000. In addition, subsequent civil suits resulting from the admission of price-fixing by the companies involved ran into many millions of dollars. William S. Ginn, former General Manager of the G.E. Power Transformer business in Pittsfield, was one of the officials sentenced to a jail term. Also, Robert Paxton, who had been the top Pittsfield G.E. executive just after World War II, testified that he had known of price-fixing situations as early as the 1930's! This was in hearings before Senator Estes Kefauver's antitrust subcommittee. Kefauver attempted, without success, to get Ralph J. Cordiner, then the chief executive of General Electric, to admit his knowledge of the conspiracy, and that this was an accepted way of life at G.E. Eventually, Cordiner did admit publically that unidentified G.E. officials had been involved in such activities and had been disciplined and demoted because they had violated G.E. 's own policy on such matters, Policy "20.5". As an interesting aside to all of this, in the early 1970's, the son of a Pitts- field G.E. executive "defected" and joined the Westinghouse Company after graduating from college. His father-was obligated to submit a formal declaration of having had contact with a representative of a competitor every time his son visited home! On a brighter note, Project EHV was now operating at 770-kv, its "South Station" was under construction, and a Family Day was held to show off the project. It had been intended originally, that the five-mile long high voltage transmission line which was a part of Project EHV would be used to actually transmit power from one end to the other. For various reasons, this was never accomplished. However, to this end, a transformer had been installed at the South Station located near Lenoxdale, Mass. Due to the size of this unit, it could not be transported via highway from the Pittsfield plant where it was built because a bridge on the route would not stand up to the weight. Thus, the transformer had to be taken down a two mile long dirt logging road through the adjacent woods! This required tree-cutting, bulldozing, gravel-hauling, and rock ledge removal along the way. However, the move was completed without any mishaps. 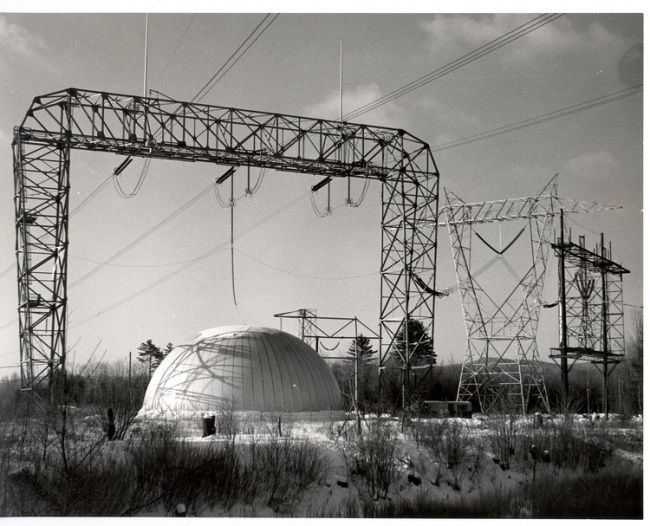 Near the North Station of the project, a three-million volt impulse generator was installed in a large fabric "bubble", which was held up by air pressure from a blower. Occasionally, when impulse tests were being conducted during damp weather, a misfire of the generator would cause a flashover to the fabric bubble. This, in turn, would cause a large tear in the fabric and the bubble would then proceed to deflate and collapse! Ted Brownlee, an engineer from the Pittsfield High Voltage Laboratory, was in charge of the impulse generator operation. The first Open House since 1955 was held. Two 607-Mva transformers were built for the East River Generating Station of Consolidated Edison in Manhattan, New York City. The Allis-Chalmers Company closed their transformer plant in Terre Haute, Indiana. However, they continued to build transformers at plants in Pittsburgh, Pa. and West Allis, Wisconsin. Five 430-Mva, 345-kv, three-phase units were shipped to Arizona Public Service. Two of these were for use at the gigantic generating station located at "Four Corners", the intersection of the boundaries of Arizona, Utah, New Mexico, and Colorado. A new corona detection system for detecting partial breakdowns in transformer insulation during high voltage "induce" tests was put into service. This system involved the use of "capacitance taps" available on the transformer bushings to derive a signal which was then displayed via a Radio Noise Meter. Bill Hopf, of Transformer Test, was instrumental in the development of this new procedure. For reasons unknown, an empty railroad flat car with a large sign bearing the name and logo of the Westinghouse Corporation was left parked on a siding near the Woodlawn Avenue bridge in the Pittsfield plant for over a week! John Church, of Transformer Engineering, finally removed the sign himself. Two 677-Mva, 345-kv units were ordered by the Commonwealth Edison Company. A replica of the original Stanley transformer was built by Larry Fairfield, of the plant's Model Shop, for the Smithsonian Institution in Washington, D.C.
Project EHV was busy with insulation tests for a proposed 700-kv transmission line by Hydro-Quebec of Canada. A lightning arrester rated at 678-kv was tested at the High Voltage Laboratory (in Building 9) for the Hydro-Quebec transmission line project. A worker was fatally crushed in Building 14, the Tank Shop. A new type of impulse test, known as the "switching surge" test, was introduced in order to demonstrate the ability of transformer insulation to withstand high voltage surges caused by switching operations on extra high voltage transmission systems. Two transformers on a multi-unit order for the Public Power Corporation of Greece ended up under fifty feet of water in New York harbor! These were 40-Mva, 161-kv units. Somehow, a barge carrying them overturned while approaching a ship for loading. Even though it was determined that the tanks had not leaked, after having been lifted from the river bottom they were still returned to Pittsfield for a complete inspection. The Consolidated Edison Company of New. York City asked both General Electric and Westinghouse for a completely new design of a gas-insulated transformer. One intended location for such a unit would be the new World Trade Center in Manhattan. 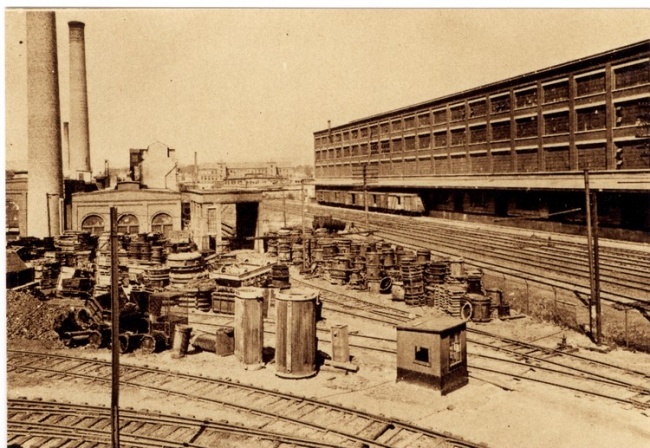 A new oil storage "Tank Farm" was built between the railroad tracks and East Street in the Pittsfield plant. The Pensioners' Orchestra played at a picnic for the Quarter Century Club at the G.E.A.A. An 800-Mva, 345/230-kv auto-transformer was built for use at Niagara Falls by the New York State Power Authority. 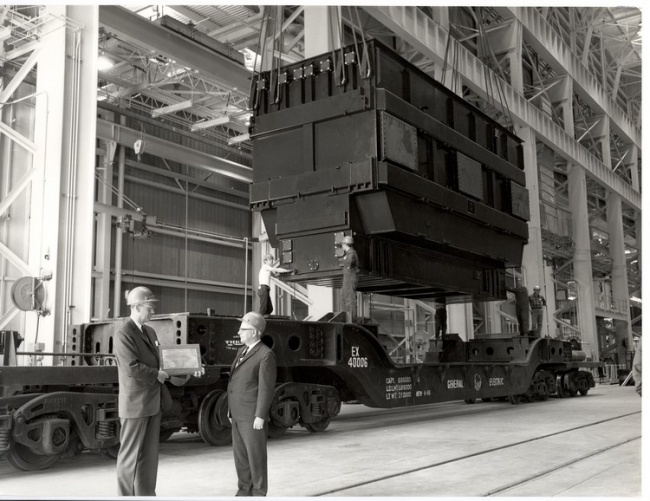 This unit weighed 491 tons installed, and was the largest such unit in the world at the time. It was put in service at the Robert Moses Plant of the NYSPA system. 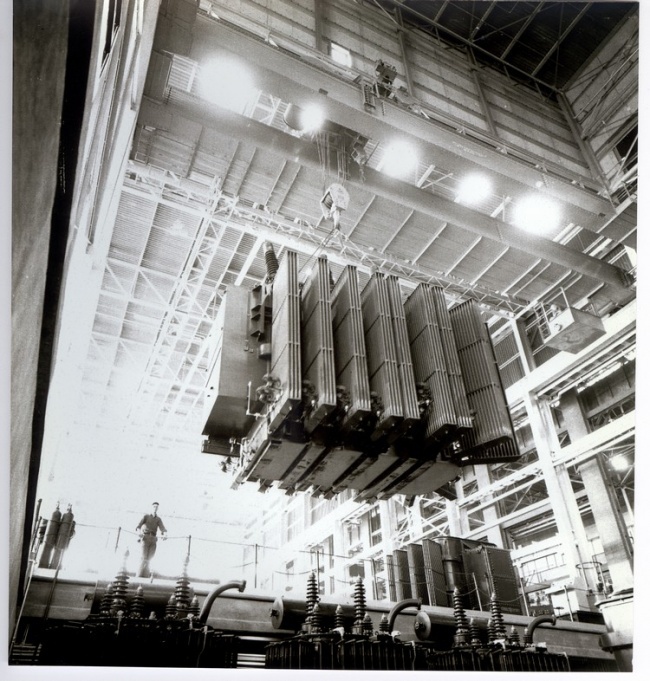 The largest generator step-up transformers in the world were the 677-Mva units built in Pittsfield for Commonwealth Edison (ordered in 1963). A new computer, a G.E. "415", was installed in Building 17. A response to a letter in the Pittsfield G.E. News confirmed that an engineer had been electrocuted in the High Voltage Laboratory in 1955! Three overhead cranes in the plant had been converted to radio-control. A portrait of William Stanley, painted by local artist Irving Sisson, was presented to the William Stanley Library by the Stanley Club. The vacuum bottle type of switching mechanism for load tap-changing in transformers was introduced. This did away with the use of contacts under oil to break the load current. The High Voltage Laboratory constructed a portable impulse generator for field testing of insulation structures. G.G. ("Pete") Kemp and Hans Morf of the Laboratory were instrumental in its design and operation. The seventh Pittsfield plant Open House was held. Previous ones were in 1927, 1946, 1949, 1953, 1955, and 1962. Announcement was made of the construction of a new Building 11, near North Gate. This was to become a Materials Laboratory. The old Building l1 on the same site was razed. Building 34 on East Street received a new facade and other modernizations. Announcement was made of the planned con-struction of Building 100, a mammoth new transformer assembly and test building. Seven transformers rated for 500-kv operation were under construction in Building 12Y. 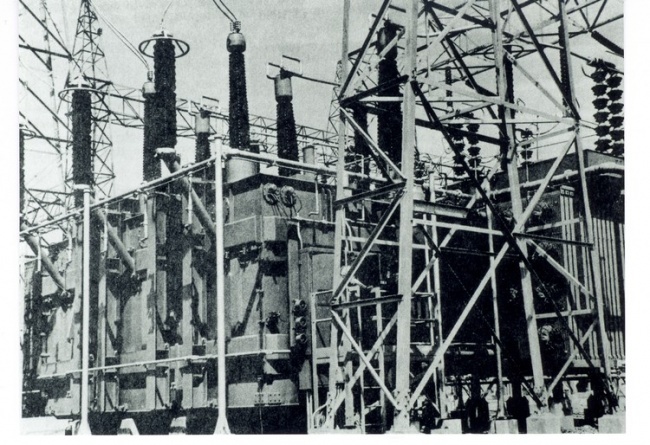 The first 500-kv units had been built in 1965. The High Voltage Laboratory's portable impulse generator was in use at Leadville, Colorado for high altitude impulse tests. The High Voltage Laboratory was named as one of twelve G.E. Research Centers around the country. 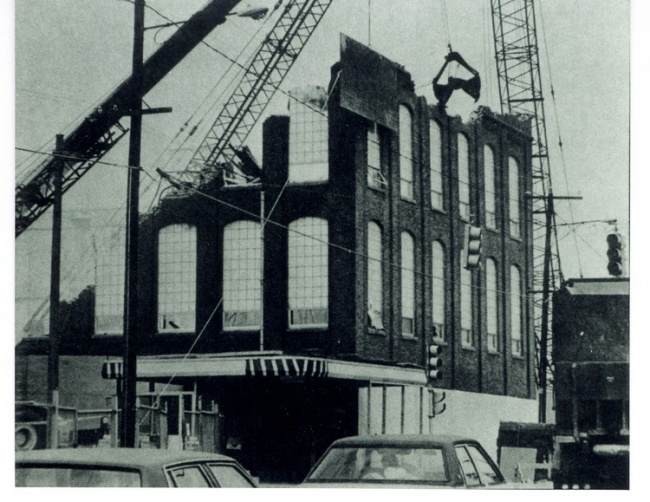 Building 7D, the Woodworking Shop, was razed to make way for Building 100. One of two large Pyranol storage tanks was removed from beneath razed Building 12G, east of Building 12Y. Williams College, in Williamstown, Mass. near Pittsfield, retired as undefeated champions on the popular television quiz show, "G.E. College Bowl". A large addition is planned for the Wire Mill, Building 66, which is located south of East Street. Merrill Road is closed to vehicular traffic due to Building 100 construction work. Building 10, a new short-circuit testing facility, is constructed south of the High Voltage Laboratory and Building 9B. A new oil separator facility, to clean oil from ground water, was built south of East Street. Power Transformer General Manager Robert Gibson retired to teach at Berkshire Community College in Pittsfield; he is replaced by Ron MacArthur. Now the world's largest generator step-up is a 784-Mva, 438 ton unit for the Niagara Mohawk Power Corporation's Nine Mile Point nuclear plant at Oswego, New York. It was built and tested in Building 12Y. An article in the Pittsfield G.E. News is about Joe Meehan, who is retiring from the Plant Transportation Operation. He recalls having used a horse and wagon to pick up the payroll at the First Agricultural National Bank in Pittsfield. This was done in the winter when the normally-used electric truck could not make the trip due to snow. The horses were finally retired in 1923. Prior to that, a total of nine horses were kept for hauling materials wagons about the plant. O.P. McCarty, of Power Transformer Engineering, obtained a patent on the use of the vacuum bottle interrupter in load tap changers. The concept is called "Load-Vac" (G.E. trademark). A new building, Building 68, was constructed south of East Street for the mixing of Pyranol. This replaced Building 12G which was razed to make way for Building 100. American Electric Power, a giant Midwest utility, ordered transformers for the largest auto-transformer bank in the world. It was to be rated at 1500-Mva, 765/345-kv. A two page article in the Pittsfield G.E. News was devoted to the traffic problem around the plant. A new plant for the manufacture of distribution transformers was built in Shreveport, Louisiana. A short-circuit test facility for lightning arresters was in operation in Building 10, using a special 150-Mva motor-generator set. This facility replaced the former test area in Building 12B. Building 7 was torn down. Built in 1907, it had been the site of development work on both silicon steel and Pyranol. It had also been used for laboratory work in the areas of high voltage and metallurgy. Peck's Bridge, on Merrill Road, which had been closed due to construction work on Building 100 was re-opened. The William Stanley Library moved to a new home in Building 11. The first of two 350-ton overhead cranes for Building 100 was delivered by railroad. A new Dispensary opened in Building 11. The world's largest generator step-up was delivered to Pennsylvania Power & Light. It was rated at 810-Mva, 230-kv. Then, the above unit was eclipsed by one for Commonwealth Edison's Dresden II nuclear plant. It was rated at 952-Mva. The first of sixty-four DC convertor transformers for the West Coast DC Intertie was shipped to, the Celilo I Substation. It was rated at 107.8-Mva, 235-kv (AC), and had been successfully tested at 600-kv DC for two hours. A new 110-ton diesel locomotive was received for use in the plant. The Stanley Club was closed temporarily due to a case of food poisoning! The new Building 11 was dedicated. Another new boiler and smokestack were installed at the Power House (Building 31). The Stanley Club was completely renovated. A new GE-400 computer was placed in operation in Building 17. The High Voltage Laboratory placed into operation a new outdoor test facility which was known as Area 72. It was located east of New York Avenue (to the east of the plant) and contained a five million volt impulse generator. 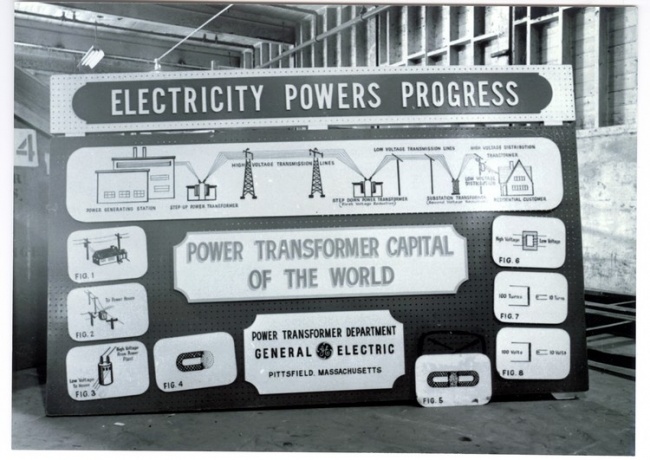 The first transformer completely built and tested in Building 100 was a 672-Mva generator step-up for Detroit Edison. A prime consideration in Building 100 was cleanliness, for the sake of the transformer windings. Any dirt blown into the windings could lead to a failure when the transformer was tested. Thus, to keep dirt out of the building, no windows were included in its design, and the overhead doors were kept closed as much as was possible (although this was very difficult to enforce during hot, muggy summer days!). In addition, there were sixteen filter and fan units on the roof of the building. These were normally arranged to pull air into the building rather than to exhaust air out. This was done so as to maintain a slight positive air pressure within the building. Thus, when a door did have to be opened, any dirt in the air would tend to blow out rather than in. Finally, as a further aid to cleanliness of windings, all untanked units were kept wrapped in plastic sheeting in so far as was possible. Elaborate precautions were taken to insure that the paper insulation used in the transformer windings was as free of moisture as possible, so as to retain its maximum insulating capability. This was the function of the vacuum treat cycle. 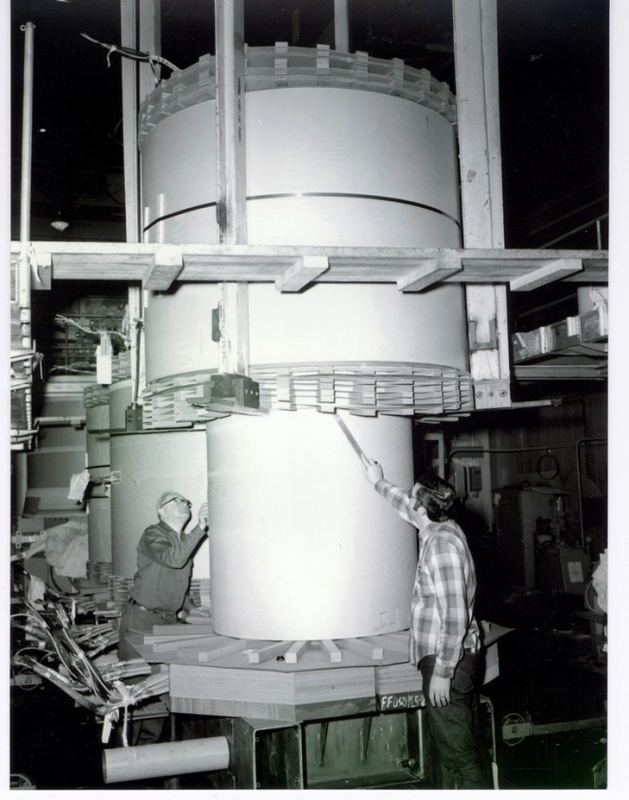 The core and coils were placed in one of several large steel vacuum tanks. The covers of these tanks were hinged, and were lifted by means of a steel cable and winch system. High pressure steam coils around the inside walls of the tank heated the interior while a vacuum was being pulled. This combination of heat and vacuum served to pull moisture out of the insulation. In addition, a quantity of a kerosene-like liquid (called "vapor-phase") was placed in the bottom of the tank during this process. The evaporation of this liquid helped to further raise the temperature of the core and coils. Thermocouples placed within the windings allowed for a determination of the dryness of the insulation according to how the heat was penetrating the windings. This took several days for large transformer core and coil units. The vacuum pulled within the tank was measured in microns (millionths of a meter). This measure of vacuum is based on the fact that normal atmospheric pressure will support a column of mercury 760 millimeters high. Thus, normal atmospheric pressure equals 760 millimeters. Since one micron equals 1/1000 of a millimeter, the vacuum attained during treat was very high indeed! When sufficient dryness was indicated by the thermocouples, vacuum was broken by introducing oil into the bottom of the tank. Oil was admitted until the core and coils were completely covered, and then the unit was allowed to soak for a prescribed number of hours before being lifted out. The core and coils were then allowed to drip while suspended by crane over the open vacuum tank. Following that, the unit was placed in a "dry room" nearby. 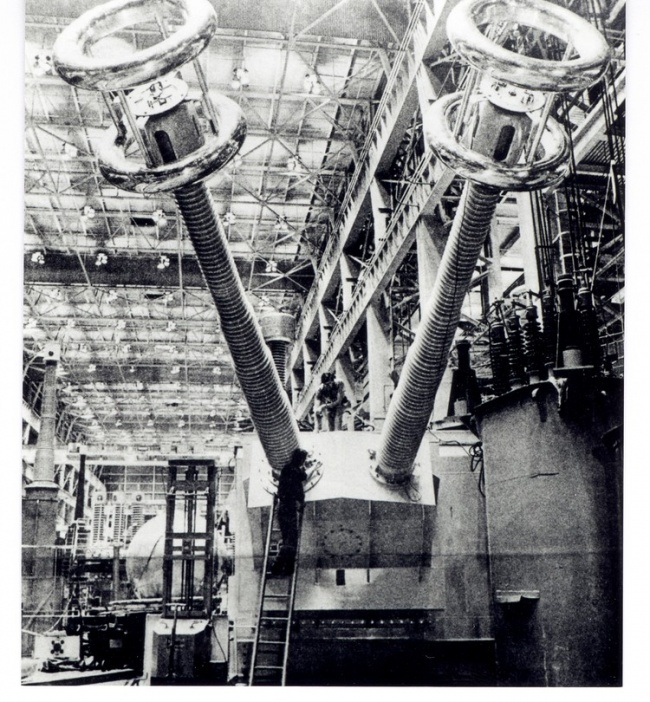 While in the dry room, "space and adjust" procedures were carried out to be sure that the coils were still properly clamped in position following vacuum treat. The core and coils were then lifted out of the dry room and placed in the steel transformer tank. Following the making of final connections (to tap changers, etc. ), the cover was welded on and a vacuum was pulled on the tanked unit to again pull any residual moisture out of the insulation. This "secondary treat" process was often called "being on one mil" because the vacuum attained was equivalent to one millimeter of mercury, or 1/760 of standard atmospheric pressure. During the process, the moisture removed from the windings was frozen by means of a "cold trap". Periodic weighing of the frozen moisture was an indication of how the drying process was progressing. When sufficient dryness was achieved, the unit was filled with oil. It was again allowed to soak for a prescribed time and was then sent to Test. Following Test (assuming it passed all tests successfully! ), the unit was drained and prepared for shipment. Nitrogen gas at low pressure was introduced as the oil was drained to prevent moisture-laden air from re-entering during shipment. A nitrogen gas bottle and regulator were attached to the unit during the entire trip to its destination. There was a "legend" passed down through the years at the Pittsfield plant concerning thieves who had been killed by suffocation because they had removed a manhole cover from a transformer tank during shipment in order to enter it and steal copper. There would have been, of course, no air in the tank! If a problem was discovered inside of a transformer during Test, all attempts were made to correct the problem without draining the oil. If the unit had to be drained, it would have to be put through the very time-consuming process of vacuum treat all over again! Don West, a Factory. Contact Engineer, became very adept over the years at accomplishing "miracle" fixes in oil-filled transformers. Sometimes, he had to perform the task at hand by stripping naked and climbing into the oil through a manhole. This would be done on the third shift, when very few people were around! The cartoon on the following page was drawn years ago by "Tex" Allen of Manufacturing Engineering. It was used as a Managerial Award to Don for one of his more cost-saving "skinny-dips". According to Don, it is accurate except for the boxer shorts added by Tex! Actually, this type of activity was not to be taken lightly. Mineral oil will coat the lungs of anyone who is unfortunate enough to accidently swallow a mouthful of it; suffocation would result. 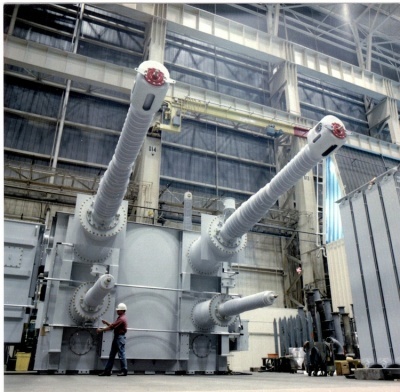 A single-phase, 1500-kv transformer was built for Project EHV. This was part of an upgrading in order to study even higher transmission voltages. 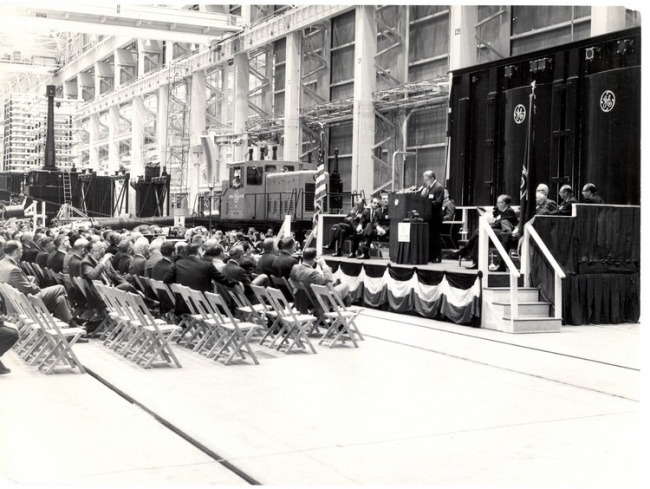 Thus, the facility was renamed as Project UHV (for "ultra-high voltage"). Thirty-one railroad transformers were built for the New York City to Washington, D.C. "Metroliner" operated by the Penn-Central Railroad. They were designed to operate on both 25-Hertz (the original railroad frequency) or 60-Hertz (for modernization work). The Stanley Club members voted to retain the membership policy of "no women"! Letters of complaint were seen in the G.E. News about Building 100: too noisy, too hot, too cold, loud steam pipe banging! An article in the Pittsfield G.E. News was devoted to an explanation of the efforts in regards to water pollution control in the Pittsfield plant and surroundings. New parking lots were built on Tyler Street Extension. An 1898 Stanley transformer was removed from a Building 12 test berth (still working!). A strike was called by the UE and IUE locals. A blizzard, dropping thirty-six inches of snow, caused the second plant closing of the year, the only two closings in memory! A massive core cradle, designed by Ed Kopf, was in operation at the north end of Building 3. This allowed steel transformer cores weighing up to 250 tons to be built horizontally and then tipped up to the vertical position. A railroad-type car, which originally was in a vertical position, was then used to move the core into adjacent Building 100. The 90-degree tipping operation took twenty minutes for a large core! The forces on the hydraulic tipping mechanism were so great that it was anchored via a foundation which contained over 100 tons of concrete, and steel pilings driven forty feet down to the bedrock beneath! The size and weight of large power transformers was always a problem as far as being able to ship them to their final destination was concerned. 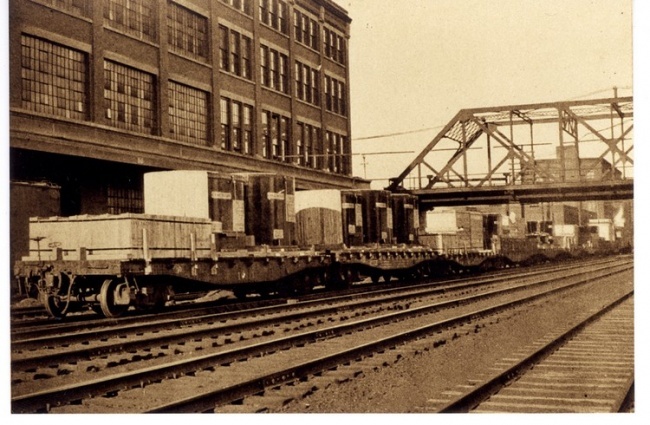 For the most part, the transformers built at the Pittsfield plant were shipped by railroad. The engineers who designed these transformers had to take shipping into account at a very early stage of the design process. There was no value to a design if the resulting transformer could not be shipped! One of the most severe limitations faced was the available clearance under the North Street bridge in Pittsfield. By the 1980's, General Electric had been in discussion with Conrail about the possibility of lowering the railroad tracks in the vicinity of this bridge to obtain a bit more clearance. This would have made the job of the transformer designers somewhat easier by allowing the use of slightly higher tanks. Of course, the closing of the Pittsfield plant in 1987 eliminated the need for such considerations! Occasionally, transformers destined for locations relatively near to Pittsfield were shipped from the plant by truck. The most obvious of this type of situation was in regard to transformers needed over the years at the Silver Lake Substation located next to the plant in Pittsfield. These were not terribly huge in weight or in dimensions, but it still required some careful planning just to move these units from their place of assembly in the plant "around the corner" to Silver Lake! 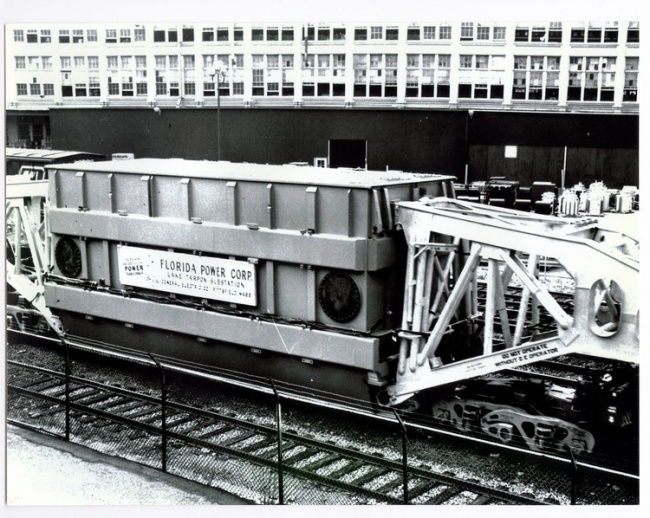 During the early years of operation at the Pittsfield plant, transformers were still small enough to be shipped on conventional railroad flat cars. If weight was still a problem, they would be shipped without oil inside. The oil would then be added after the transformer had been positioned at its destination. In later• years, this procedure became standard of necessity. Eventually, the railroads themselves designed what were known as "drop frame" cars. These cars allowed the bottom of the transformer tank to ride as close as twenty-four inches above the rails. By 1952, however, these cars were no longer able to carry the largest transformers being built; the car capacities allowed a maximum weight of 200 tons. Thus, over the next ten years or so, G.E. purchased four 250-ton, 10-axle drop frame cars themselves. Also, during the 1960's, G.E. purchased three 312- ton, 12-axle "side rail" cars. These cars allowed a specially designed transformer tank to sit between two side rails, to within only twelve inches of the track rails! In 1971, a 600-ton, 20-axle "Schnabel" car was purchased. This foreign-designed car was specially designed for the transportation of heavy transformers. The transformer tank itself actually became the car. Two end units attached to the tank via special pin fittings at the bottom. 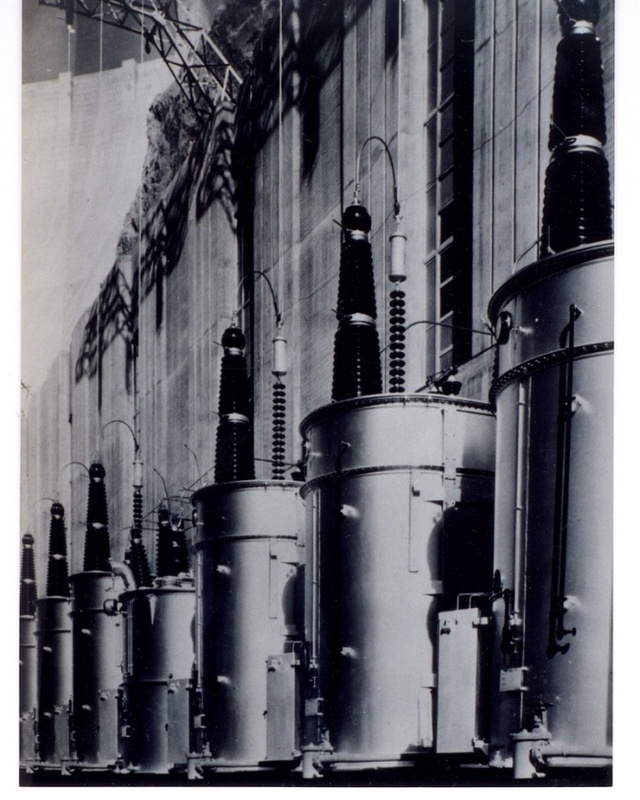 These end units were equipped with very elaborate hydraulically-operated systems which allowed for the vertical and horizontal shifting of each end of the transformer several inches. This enabled otherwise impassable clearances to be negotiated. The train had to be stopped, however, in order to perform these maneuvers. When in motion, the transformer tank was able to ride only eight inches above the rails! In later years, a total of four 325-ton, 12-axle Schnabel cars were purchased as well. Also, it had been decided to "derate" the capacity of the 20-axle Schnabel cat to 550 tons. This was merely to allow a factor of safety, not because of any shortcomings in its design. On its maiden voyage, however, the 20-axle Schnabel car was wrecked! Actually, it successfully delivered a transformer to Florida Power and Light. On the return trip to Pittsfield, the empty car (its two ends coupled. together) was located near the center of a train with a lot of heavy cars behind it. The train had to make a fast stop near Antietam, Maryland, and the Schnabel car was squeezed right off the tracks due to the weight of the train behind it. Part of it had to be returned to the manufacturer in Italy for repairs, and it was out of commission for several months. During the 1930's, the Pittsfield plant built the transformers for use at Boulder Dam (now Hoover Dam) on the Colorado River between Arizona and Nevada. Also, during the 1940's, transformers for Grand Coulee Dam on the Colombia River in Washington State were built in Pittsfield. In both cases, a rather novel approach to shipping was used. Special "tank" cars, which consisted of a container and lid combination, were built to ship the core and coils. The transformer tanks were shipped separately. The core and coil units were kept in low pressure nitrogen gas during the trip to keep them dry. This procedure had as much to do with the difficulty involved in getting the transformers into position at their destinations as with the shipping operation. For example, at Boulder Dam, the only means available for lowering heavy power house equipment to the base of the dam was via a 150-ton cableway stretched between the canyon walls. Also, for this reason, the transformers for both dams were single-phases units rather than three-phase. This meant that each transformer was lighter. Of course, three times as many transformers were needed. 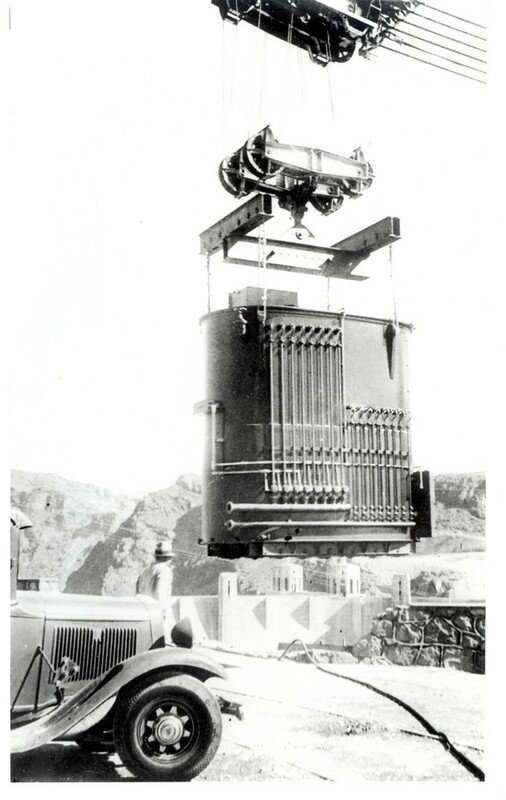 The largest transformers for Boulder Dam were rated at 55-Mva and 287-kv. Each one weighed 220 tons when filled with 22,000 gallons of mineral oil. Without oil, the weight was 135 tons; thus, they were lowered into the canyon empty. 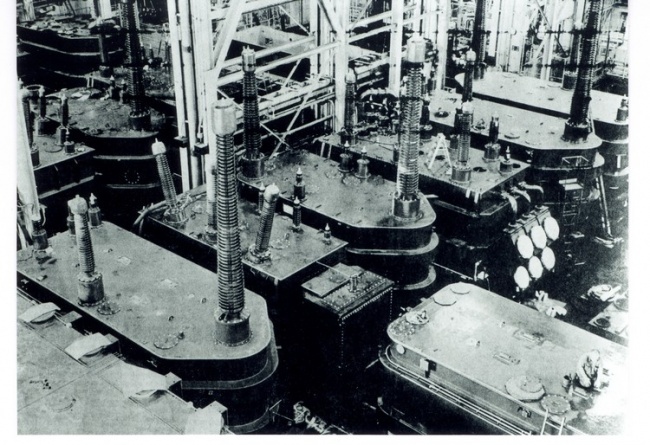 Prior to this, the core and coils had been placed into the tank at an assembly area near the canyon. The Boulder Dam order was placed in 1934, and all transformers were in place by 1936 when the first generator at Boulder Dam went on line. These transformers remained in service until at least 1983, when an extensive uprating project began at the dam. This project lasted until 1992. A total of seven 55-Mva transformers were shipped from Pittsfield (two three-phase banks plus a spare); in addition, four 13.3-Mva units (one three-phase bank plus a spare) were shipped to Boulder Dam. 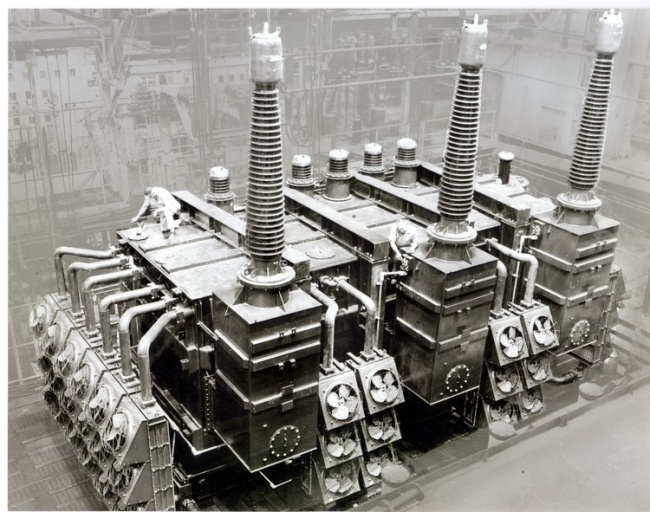 The transformers for Grand Coulee Dam, rated at 36-Mva each, were shipped in 1941. 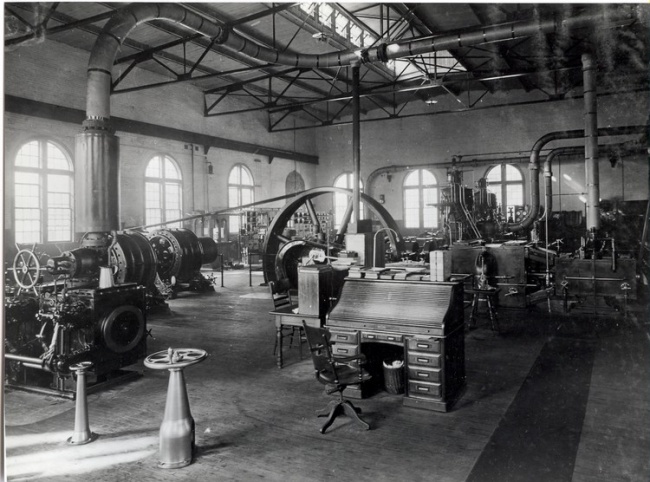 In this case, the core and coil units were placed in the tanks inside the power house itself. Both of these installations represented major advances in the state-of-the-art of transformer design and construction at the time. Perhaps one of the most difficult transformer deliveries (if not THE most) on record involved an order for HVDC equipment in the late 1970's. The shipment was to Zaire, Africa. This was formerly known as the Congo; now (in 1997) following a revolution, it is once again known as the Congo! This equipment was for an 1150-mile long HVDC transmission line which was to run from the Inga Dam on the Zaire (formerly Congo) River to a large copper mining area in the Shaba region, near Kolwezi. The primary purpose of this project was to supply electric power for the mining of copper. This was a twenty-three million dollar contract which called for the supply of thirty-two DC convertor transformers, twenty-nine smoothing reactors, and other miscellaneous types of equipment. The contract details were handled by Werner Heidemann, then Manager of HVDC Sales in Pittsfield. The shipping of this equipment presented even more difficulties than were usually encountered with the shipment of large power transformers. The units were shipped by ocean-going freighter to the port of Matadi, just up the Zaire River from the west coast of Africa. At Matadi, they had to be transferred to specially-built Schnabel cars to avoid, a series of impassable rapids in the river. Two hundred miles upstream, they were transferred to special river barges equipped with on-board cranes for the next 400 miles. Then, they were put back on Schnabel cars for the 600 mile remainder of the journey! R. Kelly Niederjohn, then a mechanical engineer in the Power Transformer Department, was intimately involved with the shipment of these transformers. In 1975, he spent sixteen days in Zaire as part of a railroad evaluation project team to determine what problems existed, with the rail portion of the journey. A plywood template which defined the outline of the largest units to be transported was run along the rail route to find and correct clearance problems. Five special 24-wheel railroad cars were built for this venture by the Maxson Corporation of St. Paul, Minnesota: two depressed-center (drop frame) cars and three Schnabel cars. Special river barges were built by Lunde, Inc. of San Francisco. Prior to this, the maximum load which could be transported across Zaire was thirty tons. The special equipment provided for this project more than tripled this limit. During 1979 and 1980, three huge transformers were built for the Southern California Edison Company. These were three-phase generator step-ups and were probably the heaviest loads (of any type) ever to be shipped by rail across the country. These units were christened the "Big Boys". They were installed at the San Onofre Nuclear Generating Station, about eighty miles from Los Angeles and near Camp Pendleton. The transformer designer was Al Rowe. Each unit was rated at 1378-Mva, stepping up from a generator voltage of 21.4-kv to a transmission voltage of 230-kv. When filled with oil, each weighed 597.5 tons, this being a calculated weight since there was no equipment in Pittsfield to actually weigh such heavy transformers! They were, of course, shipped without oil in them. 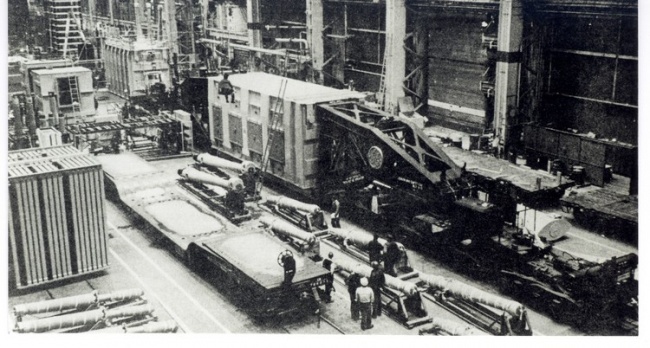 The combined weight of one of these units (empty) and the 20-axle Schnabel car which carried it was 650 tons. The cores of these transformers each weighed 254.5 tons by themselves. These cores were built in the Building 12 complex, and a Schnabel car had to be used just to move the cores from there up to Building 100 for the assembly of the transformers! This was accomplished by moving the cores out onto the main line of the railroad which is adjacent to the Pittsfield plant and then back into the plant again. R. Kelly Niederjohn, by then retired from Power Transformer Engineering, was hired to accompany each of the three transformers on its two week trip to its destination because of his familiarity with the use of the Schnabel car. He made sure that the train's braking system was double-checked before proceeding down any major hills during the journey! When the first unit arrived at San Onofre, the rigger there found that he was unable to lift it! By using a weighing method involving strain gauges, he determined that it weighed 515 tons. The calculated weight from Pittsfield, however, was significantly less than 500 tons. Thus, he had to revise his rigging set-up to be able to lift the unit. As far as this being the heaviest coast-to-coast shipment ever, a Schnabel car larger than the one used to haul the Big Boys does exist. It is believed that it has 32 or 36 axles, and is owned by Combustion Engineering. It is used to move such mammoth loads as nuclear reactors. However, it is not believed that it has ever been used for such a long distance move as this one. Conservation measures resulting from the Arabian Oil Embargo of the late 1970's caused a reduction in the use of electricity in this country. This led to severe cutbacks in expansion plans of the U.S. electric utilities. That, in turn, had devastating effects on the market for large power transformers which were the "bread and butter" of the Pittsfield G.E. operation. In 1982, according to Nicholas Boraski, G.E. Vice-President and General Manager of the Pittsfield Large Transformer Business Division at the time, "the market for our products is fifty percent below, what we had in the days before the Oil Embargo". Boraski called for a twenty-five percent improvement in productivity and said that, if the market did not improve, five hundred fewer employees would be needed by the end of 1983. Accordingly, a "Make It in Pittsfield" campaign was instituted as a means to try to save the Pittsfield transformer business. In February of 1983, sixteen hundred employees attended sessions of a presentation conducted by Boraski and Tom Wise, Manager of Engineering and Manufacturing for LTBD. Wise stated that the biggest problem faced was "the total cost to produce a transformer and to run the business". He indicated that the Westinghouse Corporation, traditionally G.E. 's major competitor in the transformer business, was facing the same situation. He indicated that three options were available for the Pittsfield operation: "Fix it, Sell it, or Close it"!! Unfortunately, the market situation did not improve, and, by 1986, the third option was the only one left. The longest strike in Pittsfield since 1946 ended in January; it had lasted 101 days. the largest phase-shifter ever built was a 300-Mva, 138-kv, 500-ton unit for the Long Island Lighting Company ("LILCO"). A second oil separator was installed south of East Street as part of a six million dollar water pollution control program. A universal spare generator step-up transformer was purchased by a Midwest utility. It was to be stored on a railroad car so that it could be moved to any of their generating stations where it might be needed in an emergency. The railroad car was supplied by G.E. as part of the purchase price! A 784-Mva, 345-kv generator step-up unit was built for Niagara Mohawk Power Company's Nine Mile Point nuclear plant near Oswego, New York. Project UHV built a ten-sided ("decagon") building for the study of transmission line insulator breakdown under contaminated conditions. A New York Times article commented on the "dumping" of foreign-built power transformers in the U.S. at artificially low prices in order to steal business from domestic manufacturers such as G.E. Both the G.E. Credit Union and the Employees' Store moved from Building 42 to a new building on Kellogg Street, outside of the North Gate. 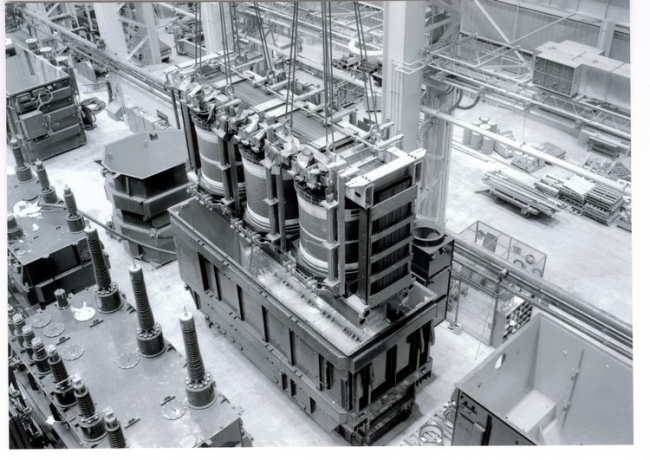 Foreign competitor ASEA, of Sweden, built a 935-Mva generator step-up transformer for Northeast Utility's Millstone, Connecticut nuclear generating station! The first shipment of a transformer via the new Schnabel car was made (see Chapter 7). General Electric Corporate Headquarters moved from 570 Lexington Avenue in Manhattan to Fairfield, Connecticut. 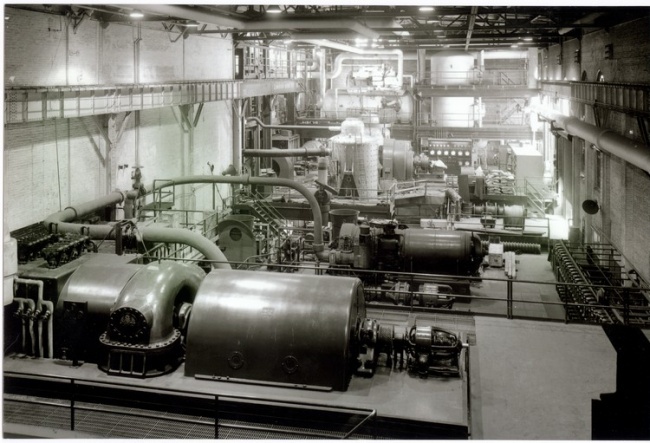 The Western Massachusetts Electric Company installed gas turbine generating units for "peaking" power at the Silver Lake Substation by the plant. A new telephone system called Centrex was put into operation in the plant. The main exchange equipment was in Building 29B on East Street (a former Berkshire Gas Company building). Three Pittsfield G.E. managers (Tony Gizzi, Deane Haywood, and Dave Herder) died in the crash of a Mohawk Airlines plane at Albany, New York. Incentive pay gave way to "day work" rates for hourly workers in the Pittsfield plant. A thermal oxidizer which burned chemical pollutants found in groundwater was installed near the Housatonic River, south of East Street. General Electric requested a probe by the U.S. Government into the practice of dumping foreign-built transformers in this country. "The Castle", longtime living quarters for G.E. bachelors, closed in Lenox. Neighbors of the High Voltage Laboratory's outdoor test area, off New York Avenue, were invited for a tour of the facility. Les Jump, an engineer who re-located to Pittsfield from the AEI Company of Manchester. in England, warned of the very real possibility of a plant closing here because he had seen it happen there! A Family Day was held in the plant in April. O'Brien's Woodlawn Cafe, and an adjoining house, on Woodlawn Avenue were razed to make way for a new parking lot. This year marked the sixtieth anniversary of the Pittsfield G.E. News. Competitor Central Moloney of St. Louis, Missouri went out of the power transformer business. ASEA of Sweden won a large order from the Commonwealth Edison Company, of Chicago, beating out General Electric, Westinghouse, and the McGraw-Edison Company. This was for seven single-phase generator step-up transformers. The New England Power Company's Bear Swamp pumped storage hydroelectric, generating facility on the Deerfield River (in the towns of Florida and Rowe, Mass.) was soon to go "on-line". This plant used two generator step-up transformers from Pittsfield with their two 300-Megawatt generators. The former Brass Rail Tavern at the corner of Woodlawn Avenue and Kellogg Street, just outside of the North Gate, was now the site of a new building housing the G.E. Employment and Personnel Office. Formerly, this had been located in Building 42. A second 1500-kv, single-phase transformer was built for Project UHV. The first had been built in 1970, and a third was to be built. It was announced that the 1903 railroad bridge within the plant was to be replaced. A 400-Mva auto-transformer was moved from a New England Power Company substation in Ludlow, Mass. to the new Berkshire Substation located on George Schnopp Road in nearby Hinsdale, Mass. This was done in order to tie the 345-kv system of New England Power to the 115-kv transmission lines between there and the Doreen Street Substation in Pittsfield. The transformer had been built in Pittsfield in 1972. Four 672-Mva, 230-kv phase-shifters were built for Public Service Electric and Gas of New Jersey. These were to be used for a system tie with the Philadelphia Electric Company in Pennsylvania. The first of twenty-six HVDC convertor transformers was built for the Square Butte project, a 450-mile HVDC line running from North Dakota to Minnesota. The first HVDC line in the country Was the West Coast Intertie, running from Portland, Oregon to Los Angeles. This was built between 1965 and 1970, and used mercury arc rectifiers to convert between AC and DC. 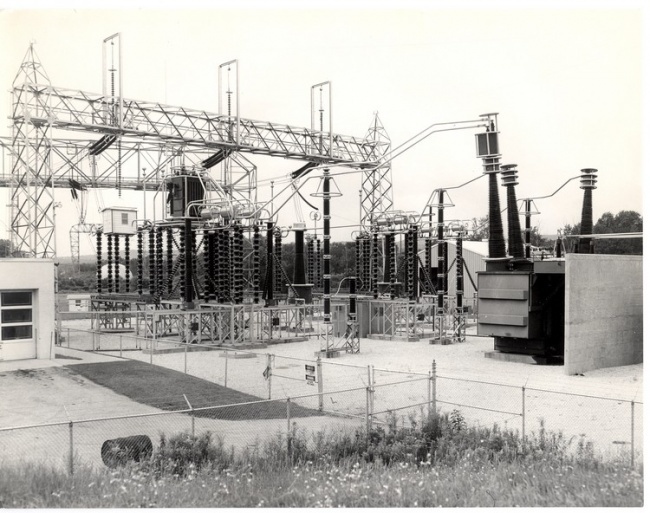 The first HVDC intertie using solid-state rectifier devices was the Eel River Project running from New Brunswick to Quebec, Canada, built in 1972. Andy Glassanos was chosen to head an HVDC research and development project sponsored by EPRI, the Electric Power Research Institute. This was to involve an HVDC tie at the Astoria Generating Station of the Consolidated Edison Company in New York City. Three new winding lathes(vertical type) were installed in Building 1, plus two of the more conventional horizontal type. The G.E. Transformer Division's computers were all centralized in Building 34 on East Street. 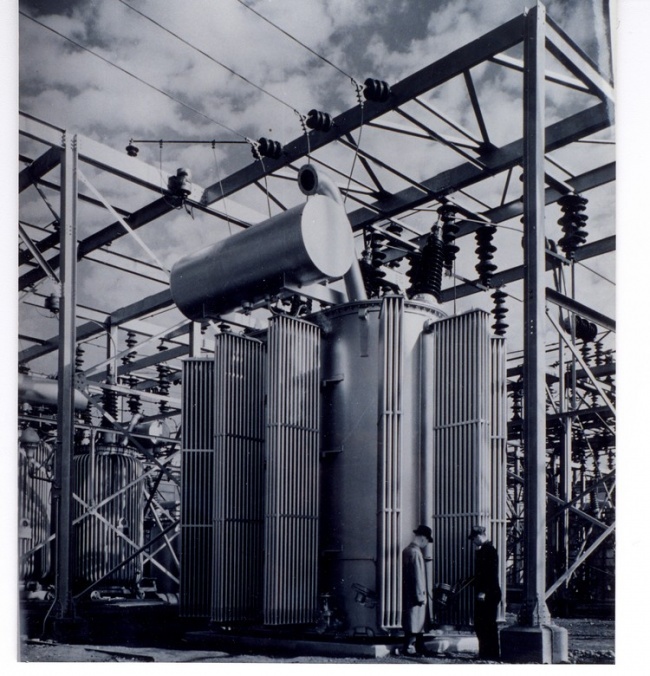 The first convertor transformer was built for the Zaire, Africa HVDC project (see Chapter 7). Competitor Allis-Chalmers of West Allis, Wisconsin announced that they were going out of the power, transformer business. In the future, their designs would be built by Siemens of West Germany. The largest transformer ever built was for the Bureau of Reclamation and was for use in Phoenix, Arizona. It weighed 900 tons (two tanks) and was rated at 500-Mva, 230-kv with a +36°/-24° phase shift. It cost two million dollars. When the first half was shipped, it ended up on its side after a train derailment near Toledo, Ohio! It was returned to Pittsfield and the re-build took six months. It was announced that the use of Pyranol would be phased out by April of 1977. An East-West HVDC intertie, using Pittsfield built convertor transformers, was placed in operation at Stegall, Nebraska. The new Berkshire Substation in nearby Hinsdale was put on-line. 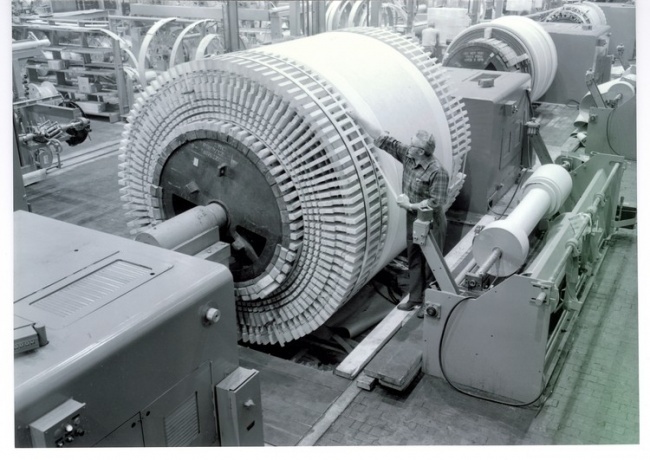 The highest capacity transformer bank in the world was in operation on the system of the Ohio Power Company (a part of American Electric Power) in Marysville, Ohio. The bank consisted of four (one spare) units rated at 1000-Mva each, single-phase. They operated between a 765-kv system and a 345- kv system. Each unit had dual 345-kv windings, each winding rated for 500-Mva. The G.E.A.A. picnic shed burned completely to the ground. It would be re-built. The Stanley Club was re-decorated. The Pittsfield G.E. Naval Ordnance Operation took over Building 34 on East Street. This was an indication of the shrinking presence of the transformer operation. The parking lot in front of Building 34 was expanded for this new usage. A really "hot" rush job was the building of a 550-Mva generator step-up transformer for the New England Power Company at Brayton Point (near Fall River, Mass.). This was a replacement for a Westinghouse transformer which had failed in service! 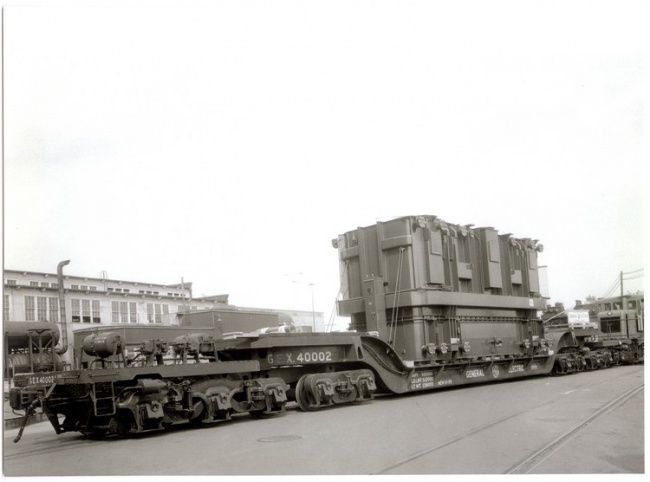 This transformer had to be shipped by rail from Pittsfield to Hudson, New York, then by barge down the Hudson River, around the tip of Manhattan Island, and out Long Island Sound to its destination because of railroad right-of-way restrictions between Pittsfield and Fall River. The transformer was, by the way, built in half the normal time required for such a unit! Then, two more rush jobs were also generator step-up units, again to replace failed Westinghouse units! These were both for Detroit Edison, and one was for the Fermi II nuclear generating station. The 1977 blackout which affected New York City created a rush order for two large phase-shifter units which were to be installed at Consolidated Edison's Farragut Substation in Brooklyn. 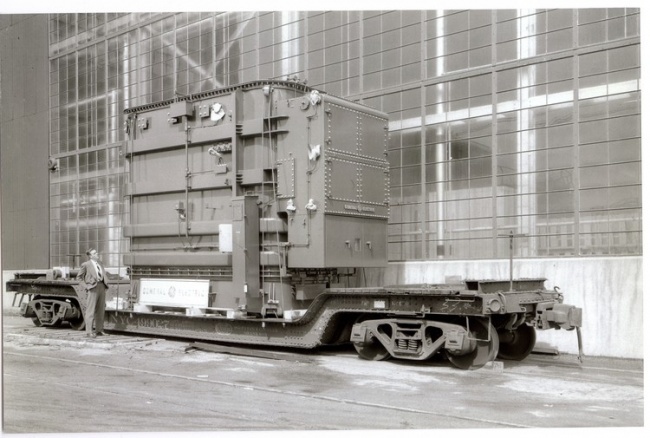 The "Big Boys" were built for Southern California Edison (see Chapter 7). Project UHV now had the capability to perform HVDC testing at either ±750-kv or at 1500-kv to ground. John Anderson, Manager of the High Voltage Laboratory, was elected to the National Academy of Engineering. A 952-Mva generator step-up from the Dresden nuclear plant of Commonwealth Edison was returned to Pittsfield for repair. Commonwealth Edison retired six single-phase General Electric transformers, each rated at 333-Kva, which had been in operation since 1914! A new GEORG core-slitting machine was installed in Building 15. This machine produced core steel laminations with very few steel burrs; this led to reduced magnetic losses in the transformers. Andy Lyke was placed in charge of a project to develop a gas-insulated transformer design for the Department of Energy. This was to utilize sulfur hexafluoride gas, aluminum foil sheet windings, and a film type of insulation (the modern equivalent of Camilli's work dating from 1937). The gate house at North Gate, built in 1912, was torn down (with some difficulty; it was well built!). This was done in order to make way for turnstiles which would use a card-key system for entrance to the plant. New parking lots were constructed along the south side of East Street to accommodate G.E. Ordnance employees who would now be working in Buildings 28, 33, and 63. These buildings had been evacuated by the transformer operation. Electric and Gas of New Jersey ordered a 500-Mva, 230-kv phase-shifter. 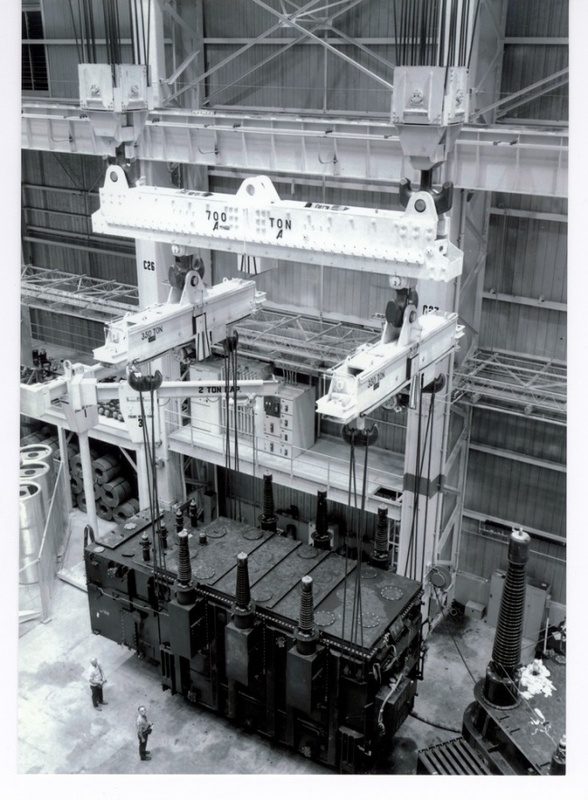 An 870-Mva, 500-kv auto-transformer was built for the Jersey Central Power & Light Company. A "Clean Room" was built in the east bay of Building 12Y for the gas-insulated transformer project. The Card-Key plant security system went into operation. Building 73, a regulator life-test facility, was constructed off of New York Avenue. The Silver Lake Barge was dismantled. This had been a facility on Silver Lake, operated by G.E. Ordnance, for the purpose of torpedo sonic testing. Nicholas Boraski, General Manager of the Large Transformer Business Division, made the announcement that work force reductions would include lack-of-work notices for some salaried employees. Building 8, built in 1901, received a new roof. At one time, this served as the Main Gate to the plant. At the same time, Building 16, next door, also was re-roofed. 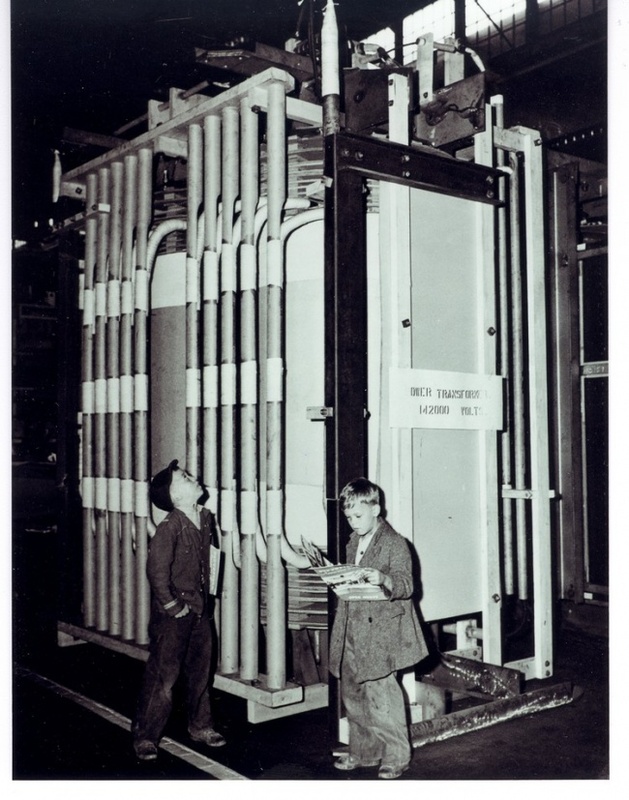 Two 3000-Kilowatt rectifier transformers were built for the New York City Transit Authority. These were part of a program to modernize the power system which provides 600-volts D.C. to run the subway system in New York City (via third rails). Herm Hill, General Electric vice-president, was quoted as saying that the transformer re-vitalization program "can work". Andy Glassanos of Power Transformer told a meeting of EPRI (Electric Power Research Institute) that "G.E. is in the power transformer business to stay!" G.E. was bidding on an HVDC project for Hydro-Quebec of Canada. Thirty-five rectifier transformers and twenty-four reactors were built for the Tokamak controlled-fusion test reactor at the Princeton University Plasma Physics Laboratory in Princeton, New Jersey. This was an attempt to harness nuclear fusion as an alternative to nuclear fission for the production of electric power. Four 56-Mva generator step-up transformers were built for the Egyptian Electric Authority. These were 50-Hertz units, this being the standard power frequency in Egypt. Four 500-Mva auto-transformers and four 400-kv series reactors were built for the GURI hydroelectric project on the Caroni River, six hundred miles from Caracas, Venezuela. This was the second largest hydroelectric project in the world, and it cost six billion dollars. 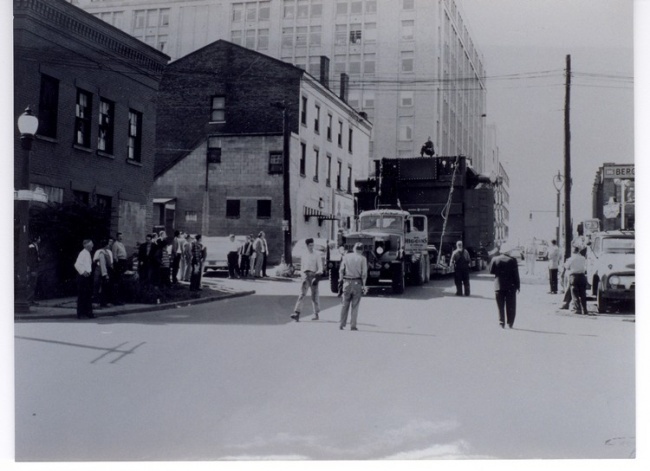 The largest transformer ever shipped by truck from the Pittsfield plant was for the Blackstone Valley Electric Company in Rhode Island. It was a 300-Mva auto-transformer with a shipping weight of 127 tons. Bill Carter, Jr. was the transformer designer. General Electric received the order for HVDC equipment for the Hydro-Quebec intertie with New England. G.E. beat out foreign competitors ASEA and Brown-Boveri, and supplied the transformers and related equipment for the southern terminal of the HVDC transmission line, located near Monroe, New Hampshire. It was to be known as the Comerford Station. Power Transformer bought one hundred thousand dollars worth of personal computers for use by Engineering and Drafting personnel. The High Voltage Bushing Operation moved into Buildings 3 and 12 from Building 51 on Plastics Avenue. G.E. Ordnance took over the latter building. The Quality Circles team-building technique was instituted in the transformer operation. Power Transformer invested in a new 320-ton, 12-axle M drop frame railroad car for the shipment of large transformers. The Pittsfield plant Materials Laboratory developed a PCB Test Kit for field testing of PCB contamination of electrical equipment. "Rusty", a Doberman pinscher owned by Pittsfield G.E. employee Tom Rousseau, had his first national TV appearance on the show "That's Incredible". Rusty gained his fame by appearing "dressed up" in a series of photos in the Pittsfield G.E. News. Tom Wise, General Manager of the Large Transformer Operation in Pittsfield, announced a "Fix-It" plan for the business. A GE/CALMA interactive graphics system was integrated into the Power Transformer Engineering CAD/CAM computerized drafting system. EPRI (Electric Power Research Institute) took over the operation of Project UHV, on East New Lenox Road, from General Electric. The Hydro-Quebec HVDC order included seven convertor transformers and three smoothing reactors for the ±450-kv line. The design of the transformers involved building windings having diameters of ten and one-half feet, the largest ever. As part of a money-saving consolidation plan for the transformer operation, many moves of plant operations were made. Engineering was moved from its long-time home in Building 16 to Building 11, several production operations were moved from one building to another, and G.E. Ordnance took over most of Buildings 42, 43, and 44. The William Stanley Library, located in the section of Building 11 which became the new home of Engineering, was dismantled. Sam Sass, retired librarian, was called in to dispose of some of the material. The very old William Stanley memorabilia was donated to Union College in Schenectady, New York. Some of the other material was given to the Boston Public Library and other libraries. Unfortunately (through no fault of Sam's), a large amount of library material eventually found its way to the Pittsfield incinerator! This had been one of the finest industrial library collections in the country. The Consolidated Edison Company of New York City ordered five hundred network transformers for use on their system. A rumor circulated that foreign competitor ASEA planned to take over the Pittsfield operation. This proved to be untrue. The announcement of the end of the transformer business in Pittsfield was made in the Berkshire Eagle on November 22. One thousand jobs would be lost. The Pittsfield lightning arrester operation was consolidated with the G.E. capacitor operation located in Hudson Falls, New York. A "Training and Development Center" opened in Building 29B on East Street to assist employees in job-hunting efforts. Salaried workers facing loss of their jobs labeled it the "gas chamber"! It was announced that Buildings 24, 26, 27, and 28 on the South Side of the plant were to be razed-to make way for new parking lots. A new water pollution treatment facility was erected on the south side of East Street. The last transformer left Building 100. A "celebration" included cake, a fountain of punch, and waiters in tuxedos! "G.E. Polymer Processing Development Center" was painted on-the side of Building 100. The "RIP" operation (Regulators and Inductive Products) was relocated from Pittsfield to Shreveport, Louisiana. Seven hundred more Pittsfield jobs were lost! The last transformer built in Building 100 (October 30, 1987) This was one-half of a "small" phase-shifting transformer for the Boston Edison Company; it was actually the next to last transformer to leave Building 100. The last one was a unit which had been returned to be repaired by TVA (Tennessee Valley Authority). To read more, continue to Transformers at Pittsfield, part 2. 4 Chapter 3: The "Current News"
5.4 Allan Barringer Hendricks, Jr.
5.8 Frank W. Peek, Jr. This page was last edited on 11 February 2019, at 17:04.